It was SO hot out yesterday! And, it seems like this weekend isn’t going to be ANY better. I was on-the-go all day long, so I needed some healthy and portable to-go snacks. Before I left, I mixed up a delicious concoction of Lemon-Lime Amazing Grass + Lemon Lime O.N.E. Coconut Water + a splash of water. I added 1 scoop of the Amazing Grass to my shaker and filled it up with 6 oz. coconut water + 2 oz. water. It was good! Very lime-y. 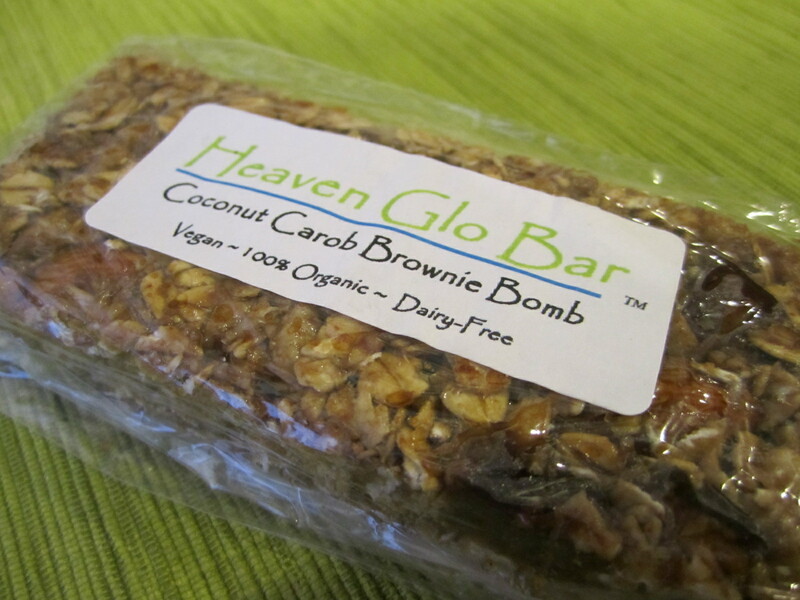 I also grabbed a Heaven GloBar. I loved this flavor because of all of the coconutty flavor! This new Amazing Grass makes me feel great. It leaves me feeling energized without drinking caffeine. I love it. 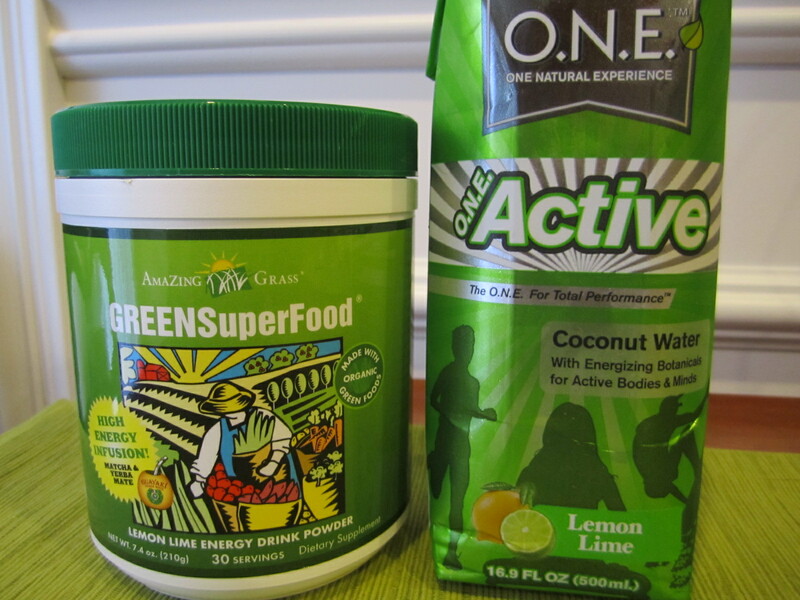 And, mixed with this new Lemon Lime Coconut Water from O.N.E. made it taste even better! 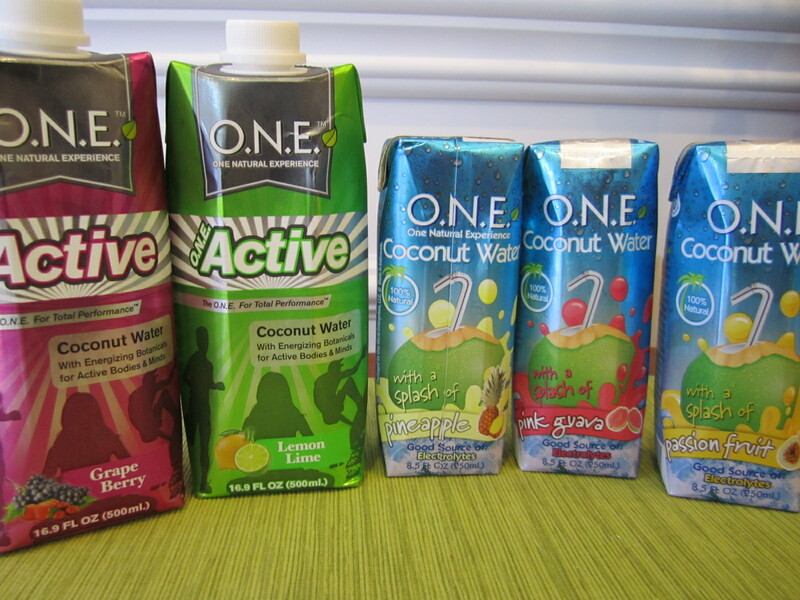 I received a few samples of their new coconut water flavors from O.N.E., including this Lemon Lime. 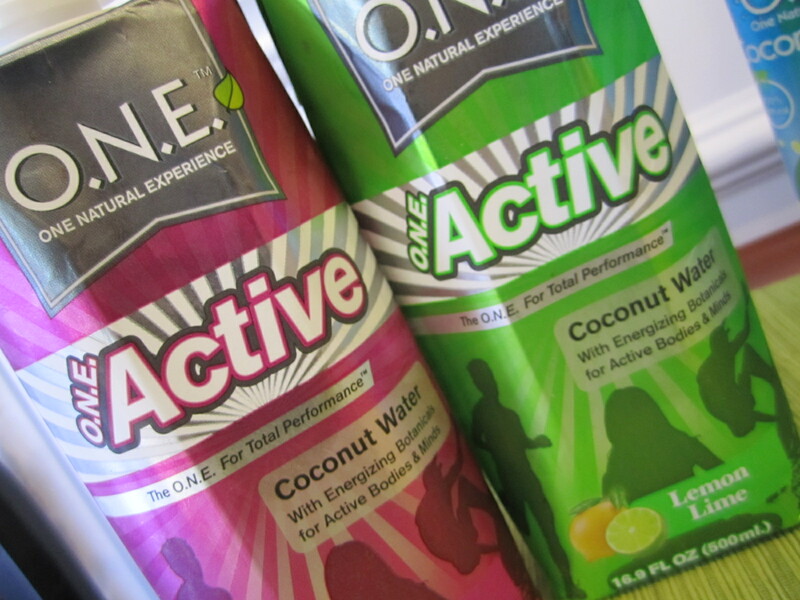 They came out with 3 Active flavors that contain coconut water along with a mix of natural energizers that help replenish you before, during and after a workout. My initial thought about the Lemon Lime was that it tasted too sweet, but mixed with a little water before my workout, it tasted great. After my workout, the sweetness was perfect! Then, I ran 5 miles on the treadmill and did a 10 minute cool-down walk. 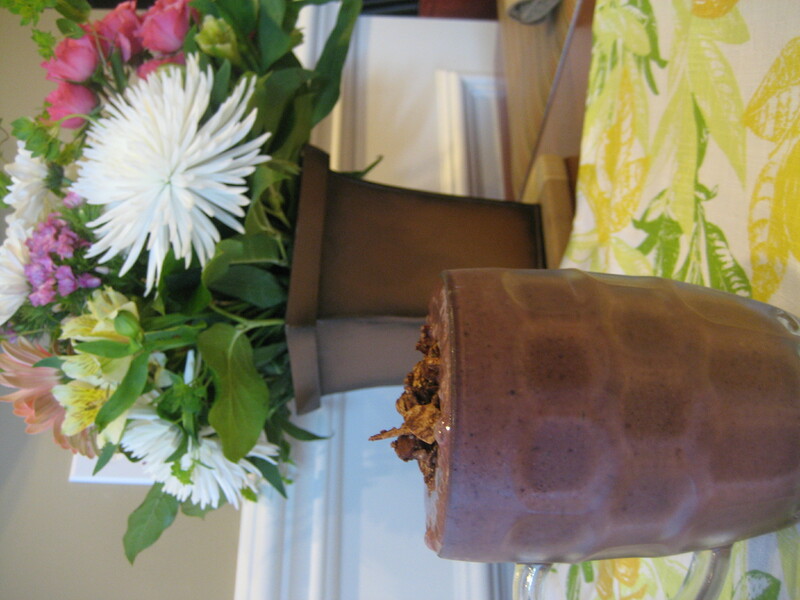 Once home, I craved a smoothie – a Chocolate Cherry Smoothie! Poured into a to-go mug to bring with my while running errands. YUMMY! Once I made it home, it was time to make our way down to NYC for the weekend. I wasn’t ready for lunch yet and I knew we would be having dinner upon arrival, so I packed a few road trip snacks. Just cut it in half and remove the pit before packing. Bring along some spices to sprinkle on it and pack a spoon! Then, enjoy on the road. Homemade juice also travels easy. Just make your juice (and clean the juicer before leaving!) and pour it into a glass smoothie cup for easy travel. This way you can throw it in a bag and not worry about it spilling all over. I also packed a container of pre-cooked lentils and a fork. 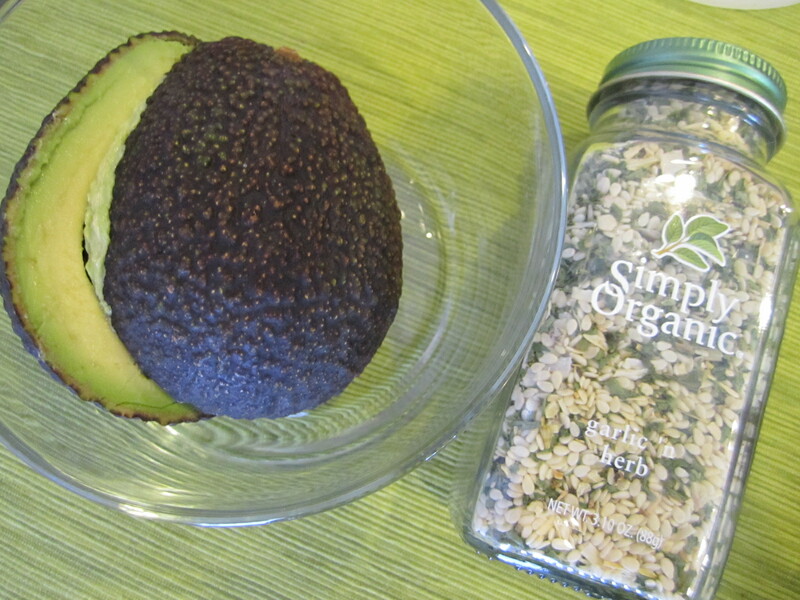 All together – juice, avocado, lentils – this made a decent meal and kept me occupied on our drive. Off to explore, have a great weekend! We are headed out of town this weekend on a mini vacation, so I wanted to leave you with something fun! I get quite a few questions from readers, family and friends about some of the things that I eat, bake and cook with and why I use them over other ingredients. Therefore, I thought that it would be fun to write a post about some of my favorite ingredients. Since I have so many favorite things, I decided to split this up into two parts. Chia seeds are packed with fiber, antioxidants, protein, vitamins, minerals and omega-3. They are extremely easily digestible in their state, unlike flax seeds which need to be ground. They are great for athletes because the seeds give you an energy boost and absorb water to keep you hydrated! 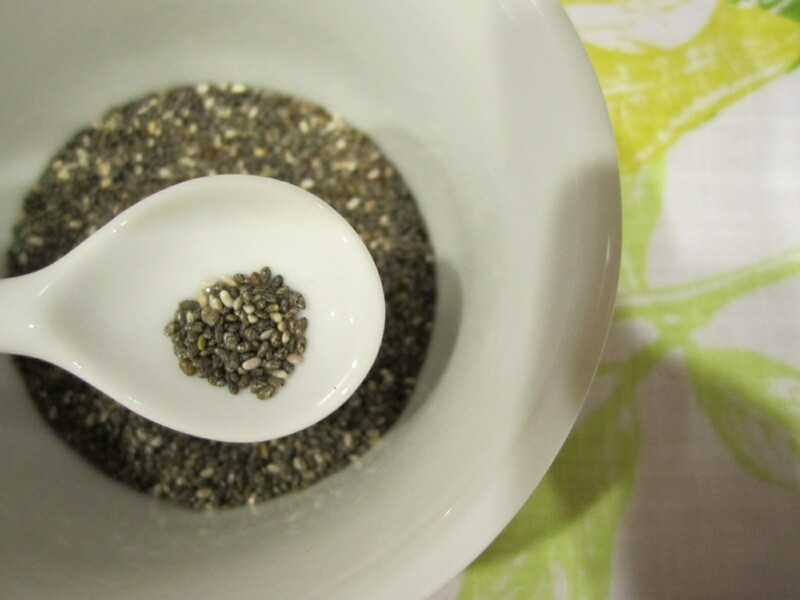 You can eat chia seeds on their own, but I prefer to add them to smoothies, yogurt and oatmeal! Brown rice syrup is a sweetener with a honey-like thickness that will not cause your blood sugar to spike. It is a simple sugar which means that your body does not need to work as hard to break it down for digestion. All sugars that enter your body are broken down into simple sugars before they can be digested. In this case, the work has been done before the sugar enters your body. This makes brown rice syrup one of the healthiest out there. 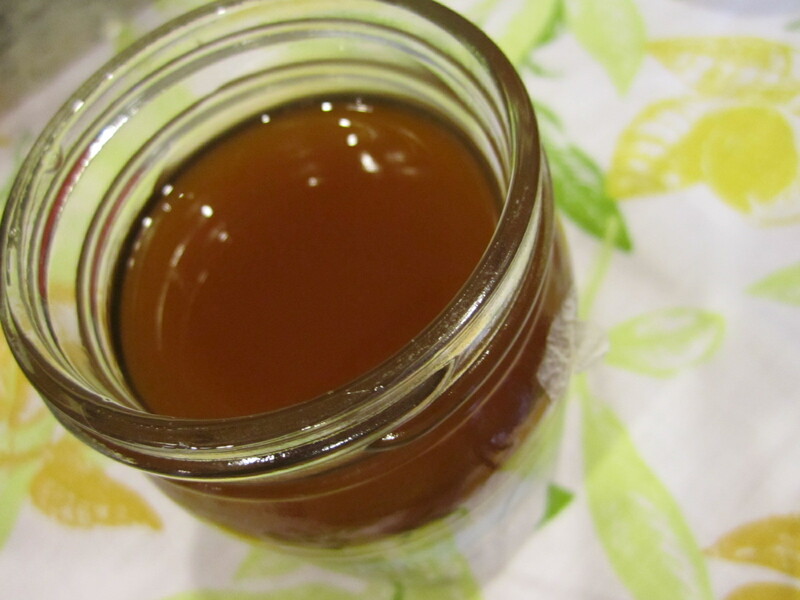 I like to substitute brown rice syrup for honey, maple syrup, white sugar, etc in recipes. What is not to like here? Almonds are packed with all sorts of stuff – Vitamin E, calcium, fiber, magnesium, potassium, zinc and iron – making them one of the healthiest nuts out there. 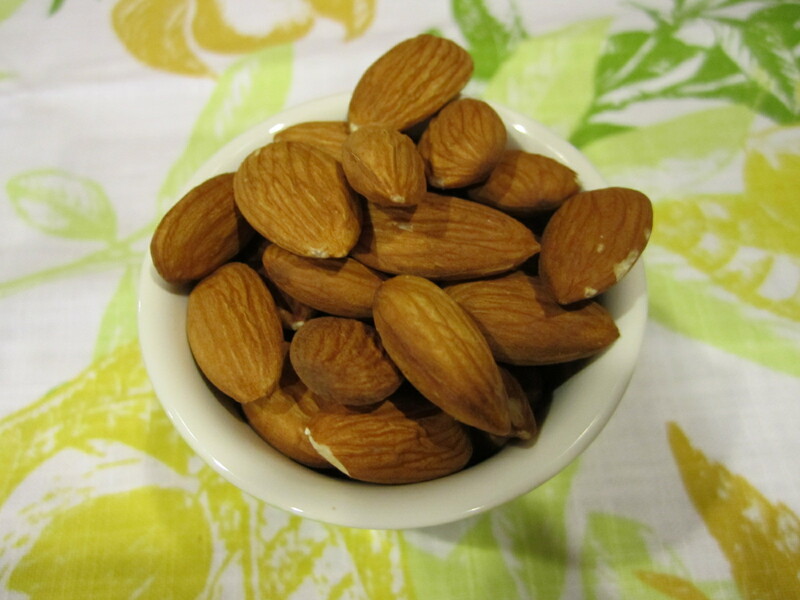 Yes, like all nuts, almonds are hign in fat. However, they are high in monosaturated fat which is the healthy fat. The kind of fat that your body uses to live. Eating almonds has been show to lower your LDL (bad) cholesterol and will keep your cravings at bay by keeping you satisfied! Almonds are tasty on their own, but I also love them in trail mix, cereal, on top of oatmeal or crushed into almond butter! Did you know that cinnamon is often used as a health remedy? It slows the rate at which the stomach empties after you eat, which reduces the rise of blood sugar after meals. 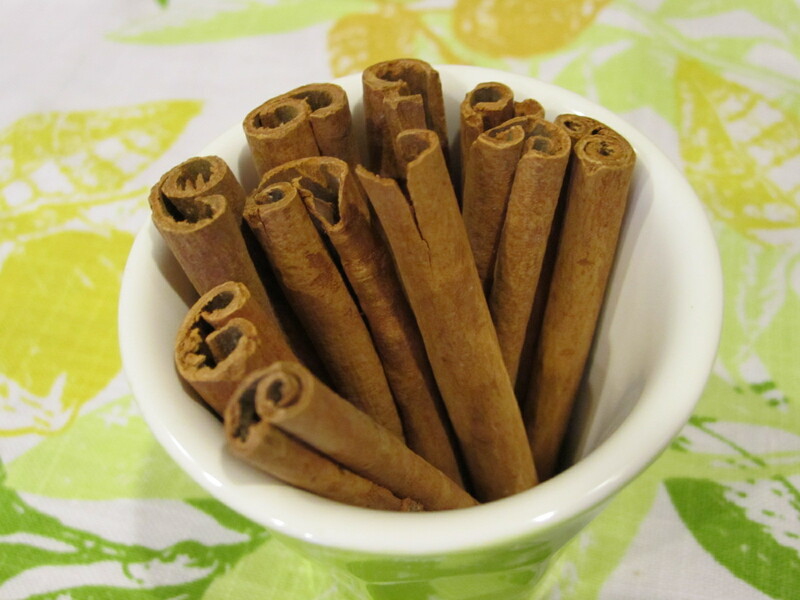 Cinnamon is also a great source of dietary fiber, iron and calcium. Plus, it tastes delicious! I love cinnamon mixed in oatmeal and yogurt or sprinkled on fruit. I would choose greek yogurt over other types anyday! It has a thicker texture which turns some people off, but once you get used to it you won’t look back. 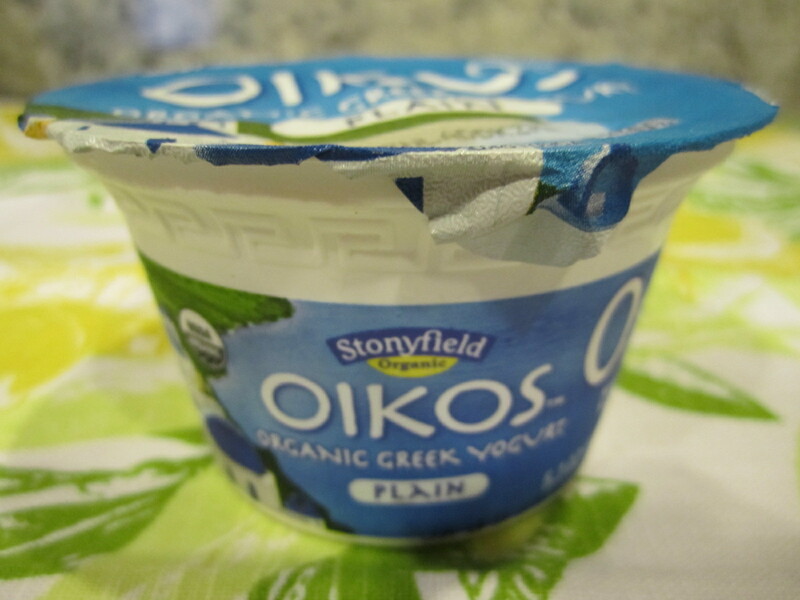 Not only does greek yogurt keep you full much longer than other types, but it is also full of protein! Make sure to watch the sugar content if you buy flavored yogurts – it is can be decieving! I prefer to buy plain greek yogurt and add my own flavorings. You can add everything – vanilla, honey, peanut butter, granola, etc. These 2 things could easily be my favorite! Cacao = Cocoa. 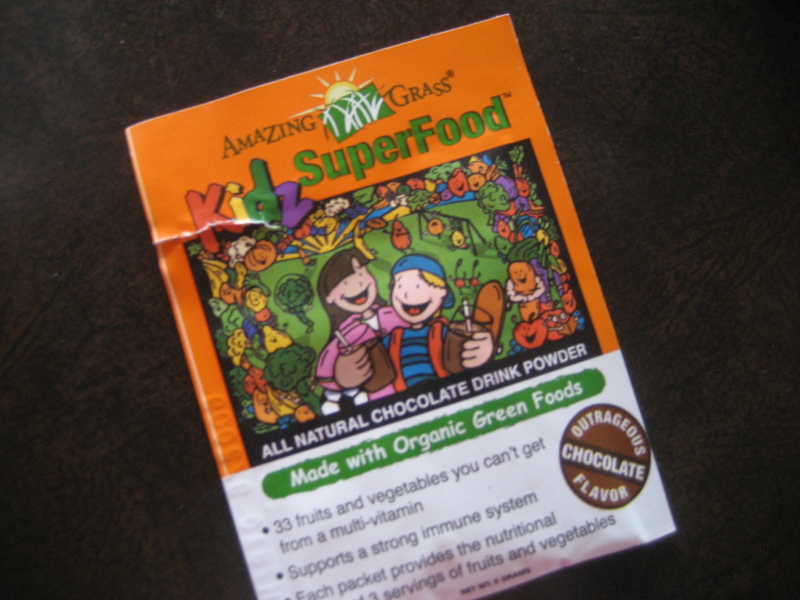 Cacao powder is unsweetened and usually raw. It is ground from cacao nibs. 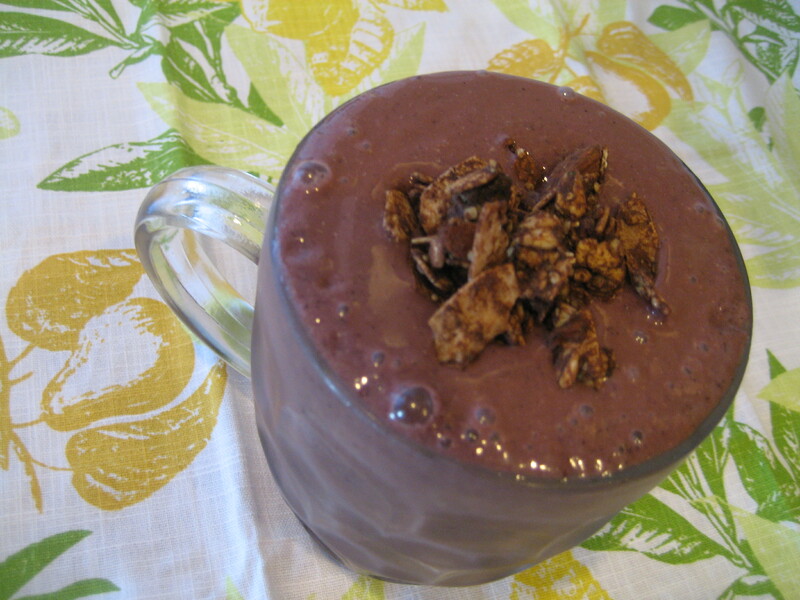 Cacao nibs & powder contain more antioxidants and magnesium than any other food out there. 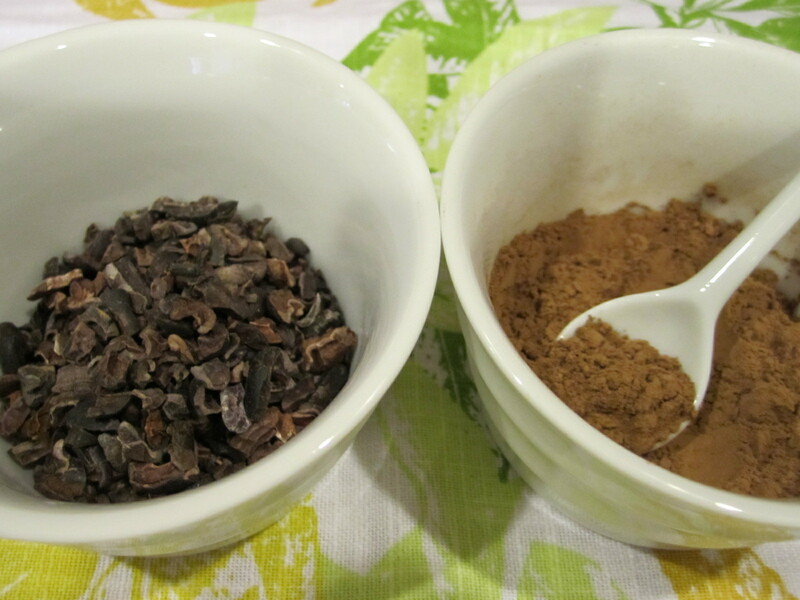 However, in order to reap the benefits, you need to eat cacao in it’s natural form – the nibs and powder count! 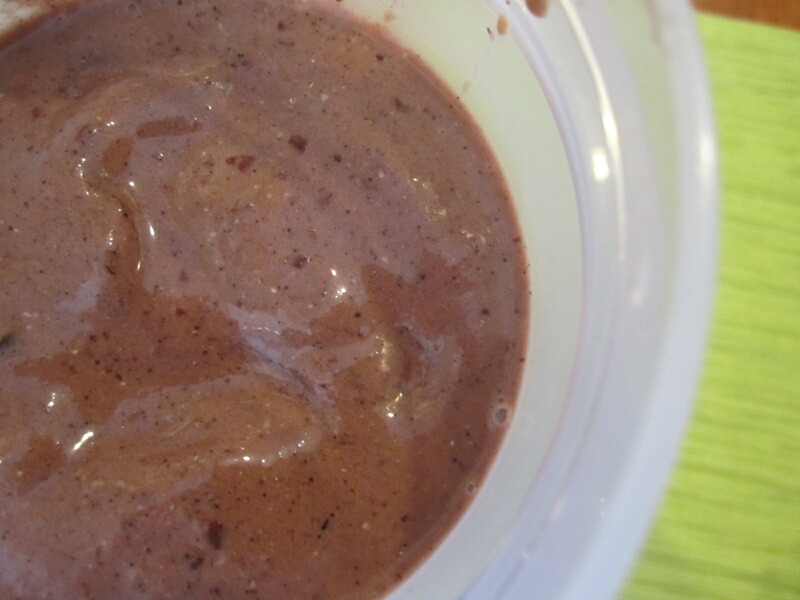 Cacao powder is delicious when added to smoothies or in oatmeal. 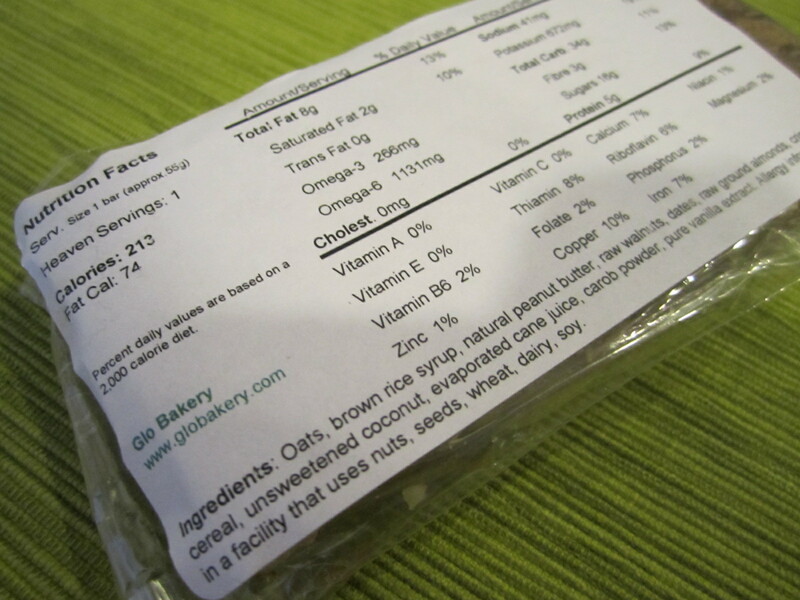 You can use it as chocolate in baked goods when combined with a sweetener of your choice. 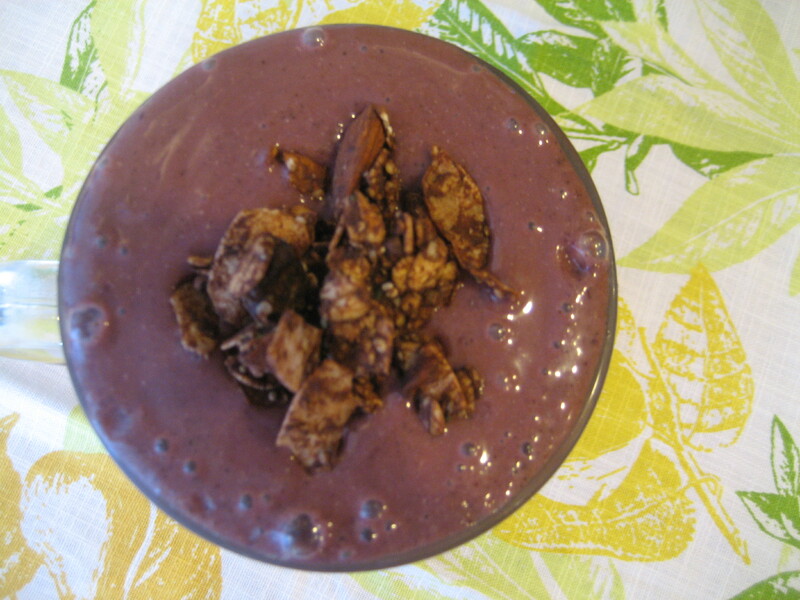 I add cacao nibs to everything – trail mix, oatmeal, cereal, yogurt, ice cream, etc! Coconut water is my post-workout drink of choice. 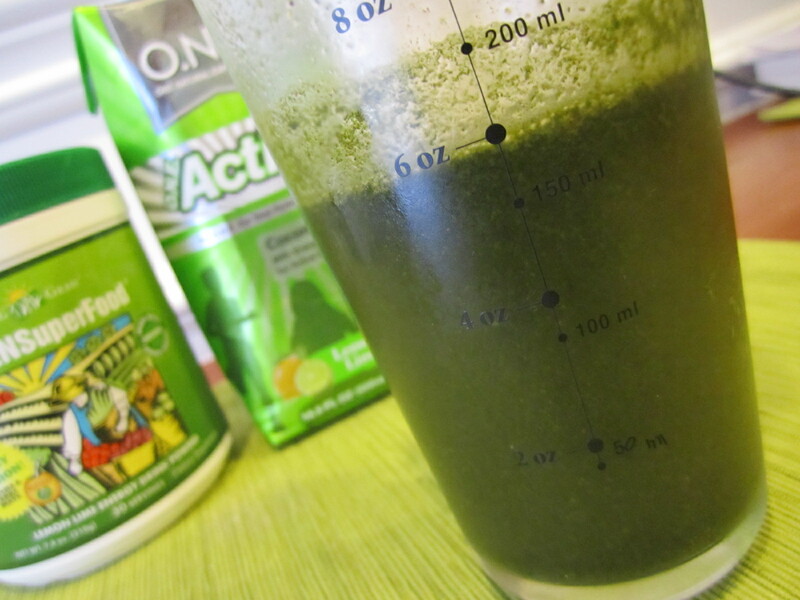 It contains natural electrolytes to replenish lost stores in your body. Check out more benefits of coconut water in my last post! 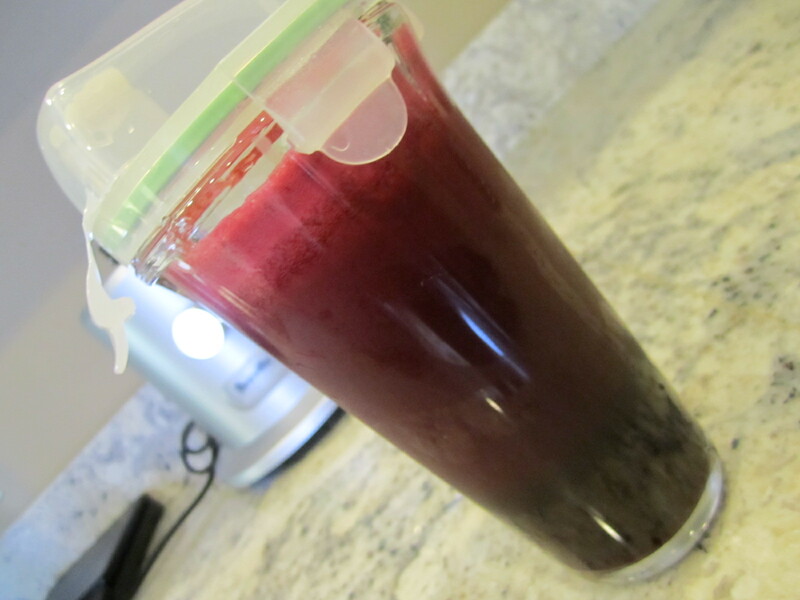 Drink it straight up, mix is with your favorite fruit juice or add it to a smoothie! Ginger is often used to aid in digestion, treat stomach upsets and nausea. It has also been shown to treat arthritis and the common cold. I love ginger for the taste, but I also love it for helping with tummy troubles. I drink ginger tea after large meals or when my stomach is upset. 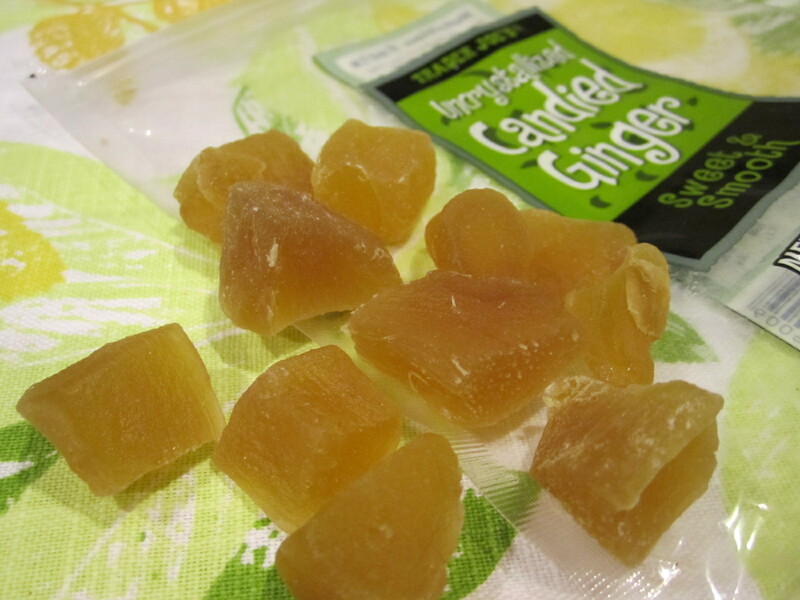 I also love dried ginger! It’s perfect to keep in your purse to nibble on a few pieces after you eat or drop it in a cup of hot water for tea. Flaxseeds are very rich in omega-3’s which makes this seed very powerful for everyone, especially vegetarian’s and vegan’s who stay away from animal products. 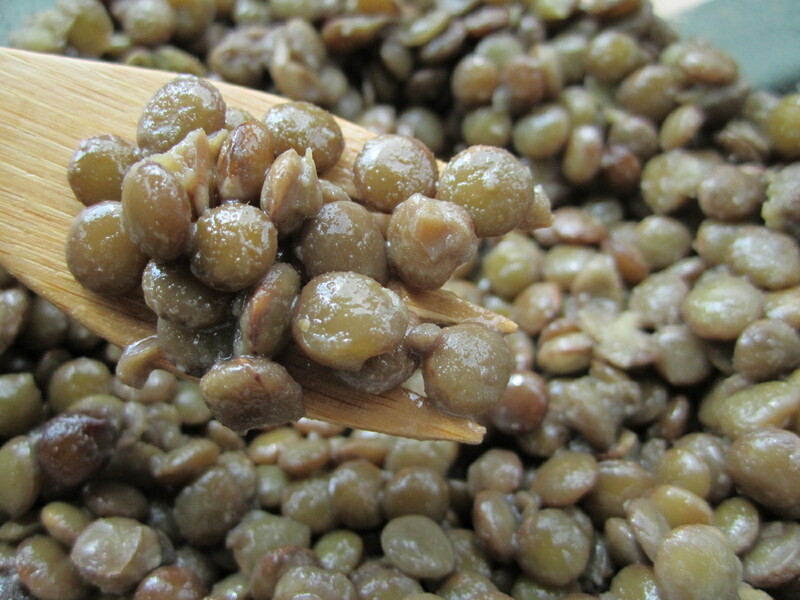 It also contains a lot of fiber and has been shown to increase immunity strength in your body. 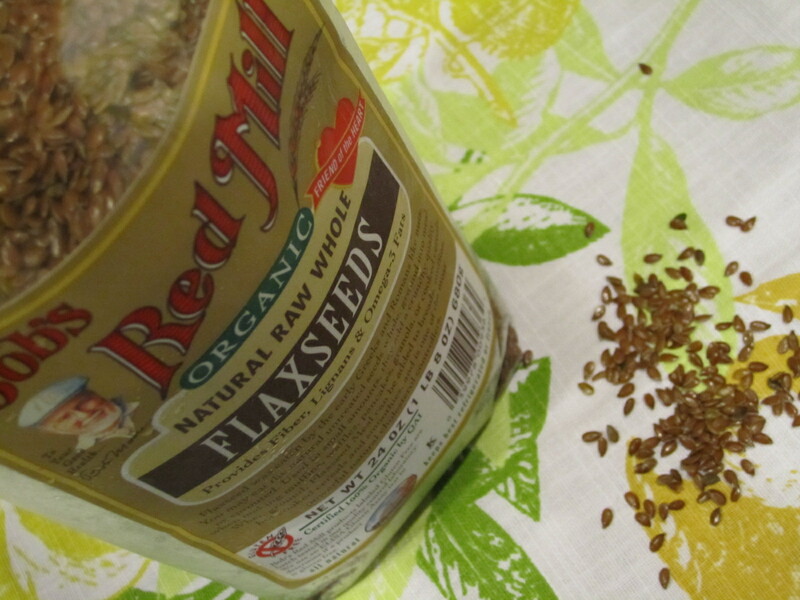 Whole flaxseeds cannot be digested by your body, so it is important to grind them (or purchase the ground!) before eating. I grind my own in my coffee grinder! 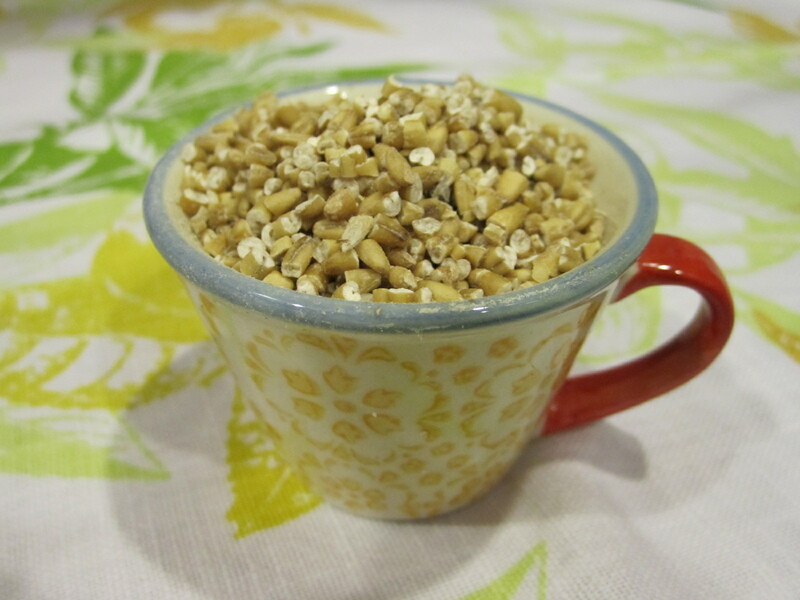 Flaxseeds and ground flax can easily be added to yogurt, oatmeal, cereal or in baked goods! In a nutshell, oatmeal is good for you. 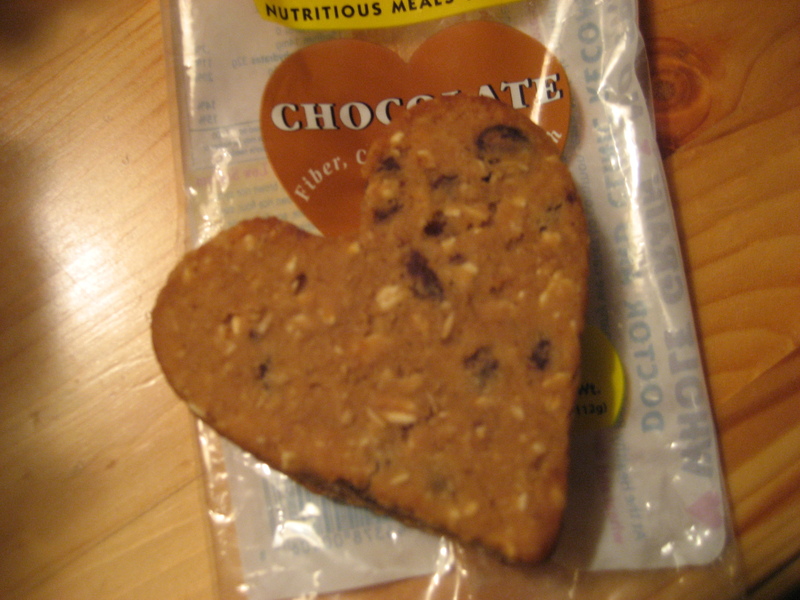 It has been shown to reduce cholesterol when eaten on a regular basis. 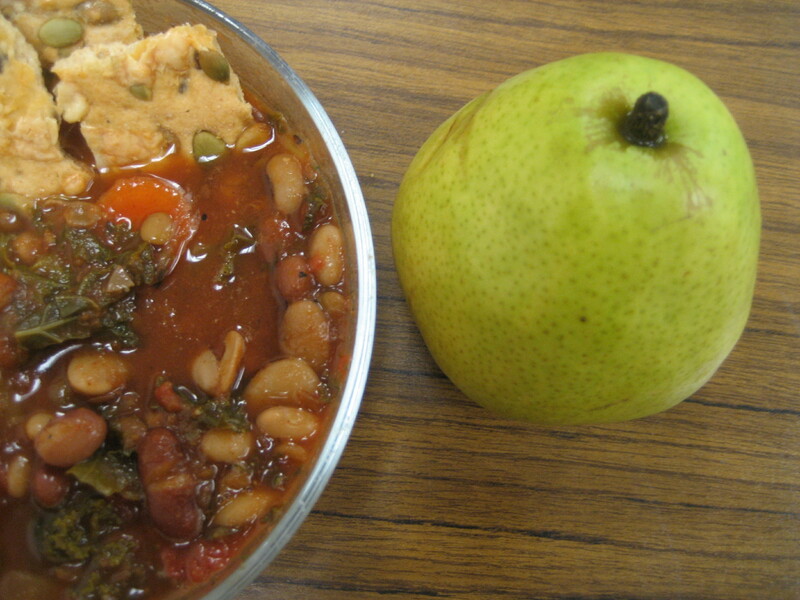 It is filling, satisfying and a great breakfast, especially on cold winter days! Oatmeal is high in protein and fiber and will not make your blood sugar spike. I prefer Steel-Cut Oats because they are the least processed of most oats. The different types of oats (steel-cut, rolled, oatbran) all have to do with the amount and type of processing that they go through before hitting store shelves. Steel-cut oats take much longer to cook due to the minimal processing, but it is worth it. They have a heartier taste that I love! I hope you enjoyed seeing some of my favorite things! Make sure to come back later on this weekend for part 2! It sure is a hot one out there today! I started out my day feeling so dehydrated. This weather will really do that to you before your body adapts to it. But, I was determined to get out there and run so I chugged some water and ate a few dates as pre-run fuel and set out for a run. 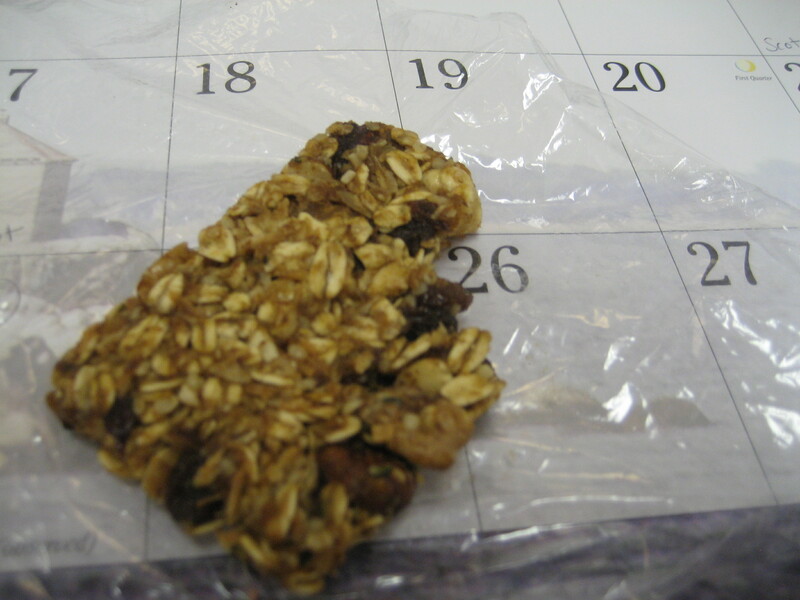 Mid-morning, I chugged some more water and had a homemade Maple Granola Bar. 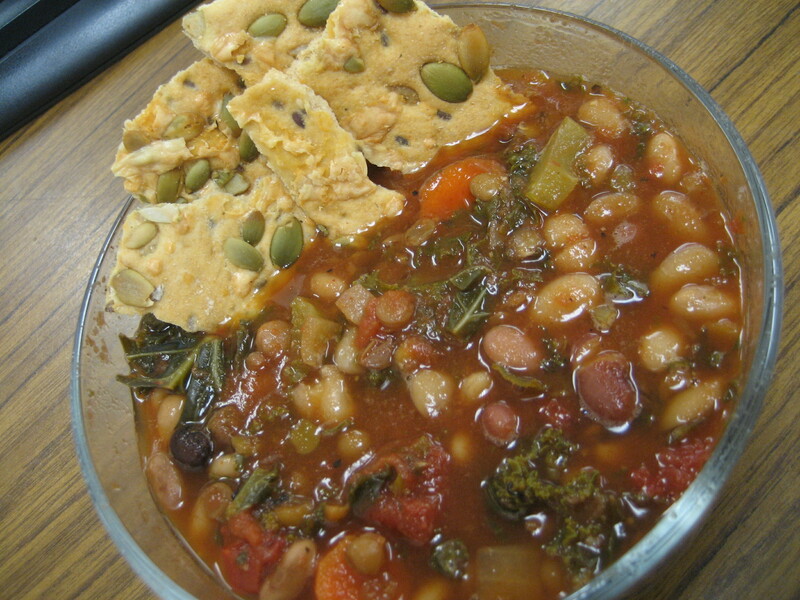 Lunch was leftover Bean Chili with Dr. Krackers. Like I said before, this week is ‘eat up your freezer foods’, so I grabbed a chili on my way out the door this morning. Not the best lunch for a hot hot day, but I work in air conditioning, so I’m usually freezing. Served with a super juicy pear. Hot weather = I crave juicy fruit all day long! 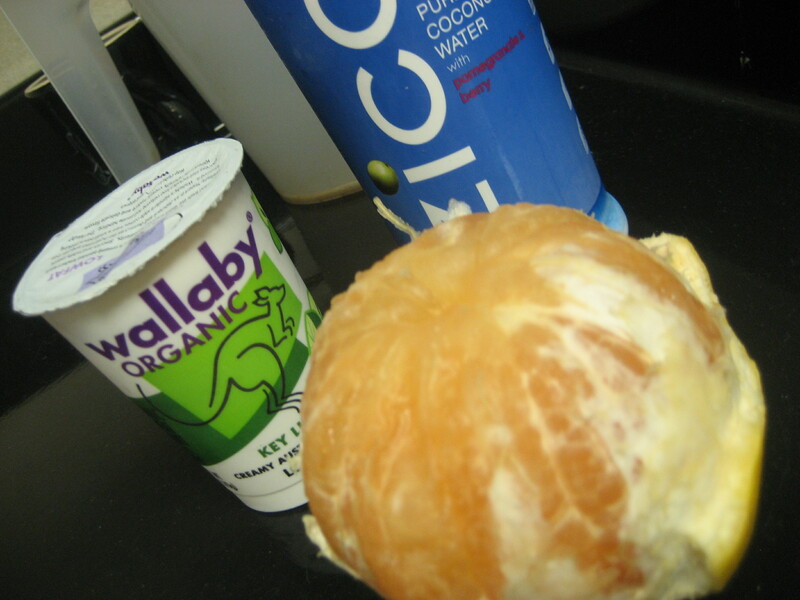 Mid-afternoon, I broke out a juicy grapefruit, yogurt and a new flavor of coconut water (which I have been sipping on since lunch). Zico came out with 2 new flavors of their coconut water – Lima Citron and Pomberry. I tried both of them at the NYC Half Marathon expo back in March, but it was just recently that they hit store shelfs. I saw them on Sunday and was psyched (obviously!). I tried the Pomberry today and liked it. 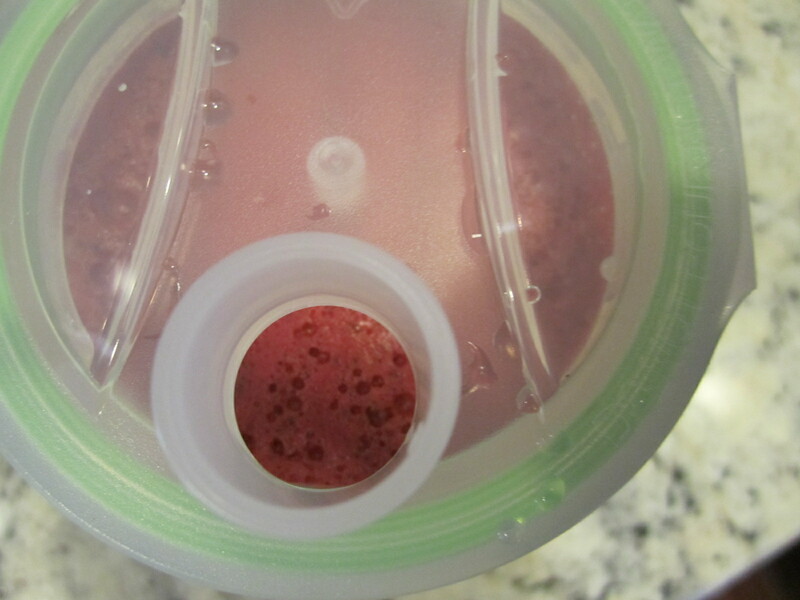 It contains coconut water and natural pomegranate and berry flavors…nothing else. Nothing artificial. It has just the slightest a hint of flavor. I still prefer plain coconut water over anything else, but these hints of flavor are a nice change once in awhile. It would be great after a long workout on a hot day! Each bottle contains 14 ounces, which is one serving and contains 60 calories. Edited to add: Veggie Burgers for dinner! 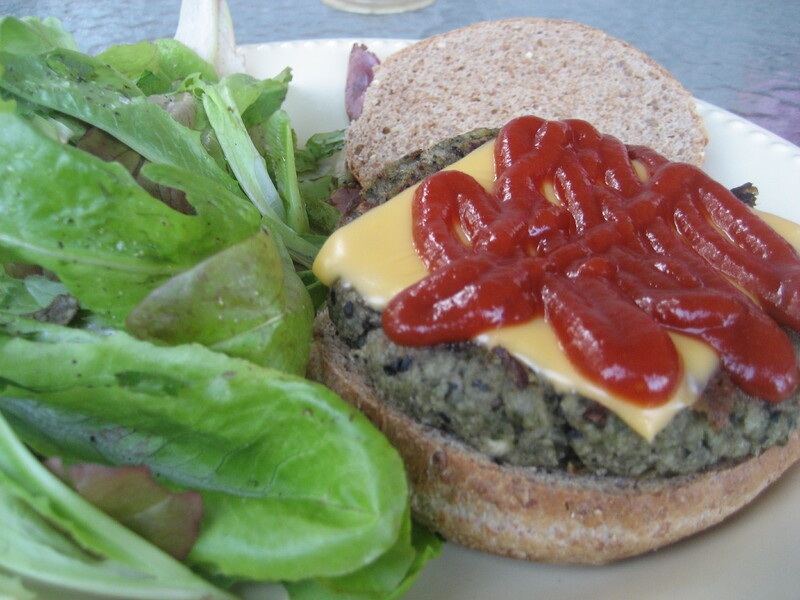 With a slice of american cheese and ketchup. 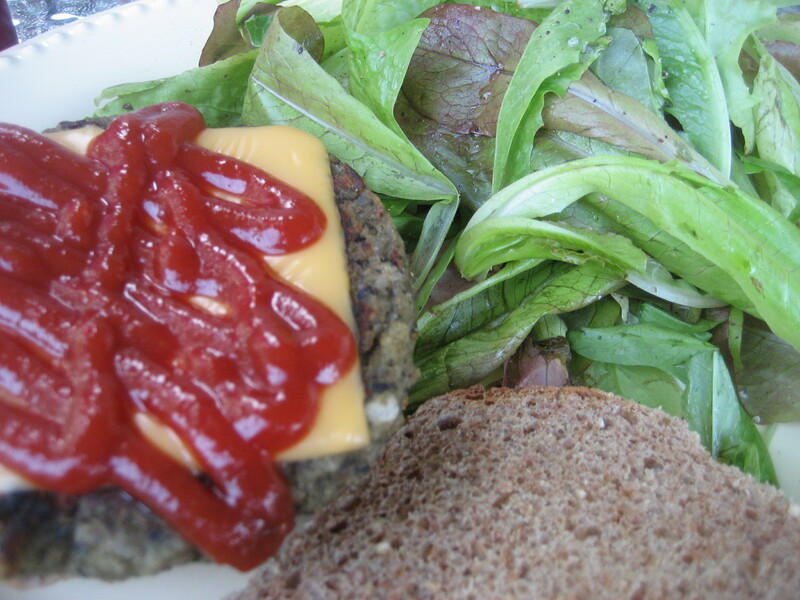 On a sprouted bun with farmer’s market greens mixed with a little olive oil, salt and pepper. What a great Sunday! It is so nice to have a weekend where I have nothing super important to do. And, a gorgeous weekend at that! Breakfast was delicious. I haven’t had french toast in quite awhile and it always tastes great. I am not a big pancake or waffle fan, but french toast is a whole different story. It is so simple to make, and definitely tastes great. I like it for a treat every now and then. 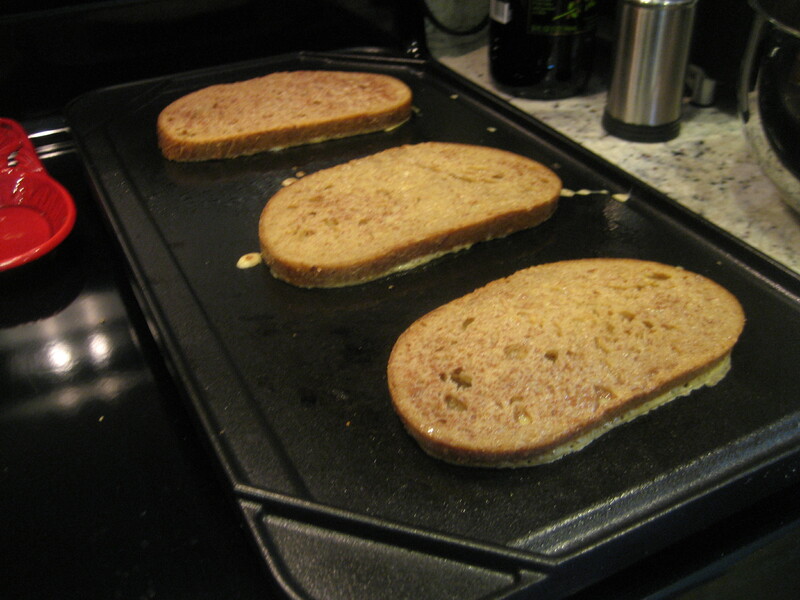 He dipped the whole wheat toast into a mixture of eggs, milk and cinnamon. Then cooked them on the griddle until golden brown. 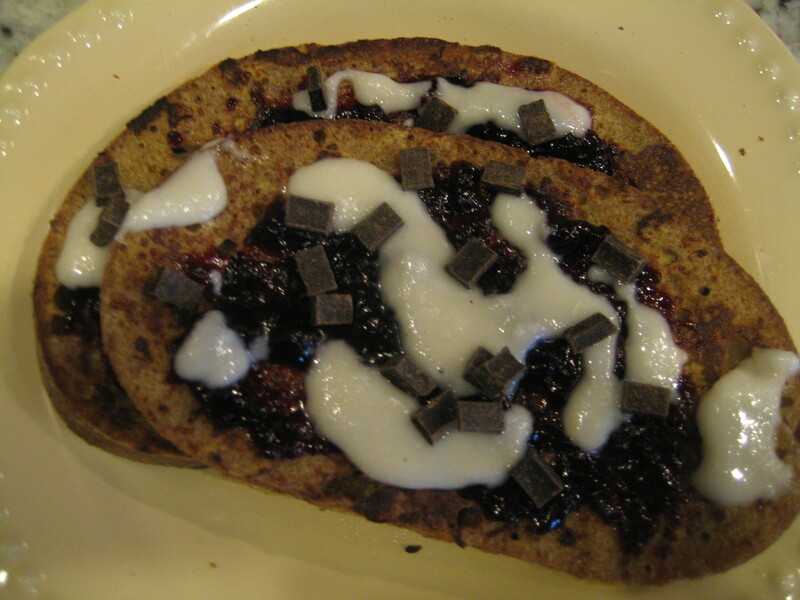 I topped my 2 pieces with raspberry jam, coconut butter and a few dark chocolate chunks! This was so good! 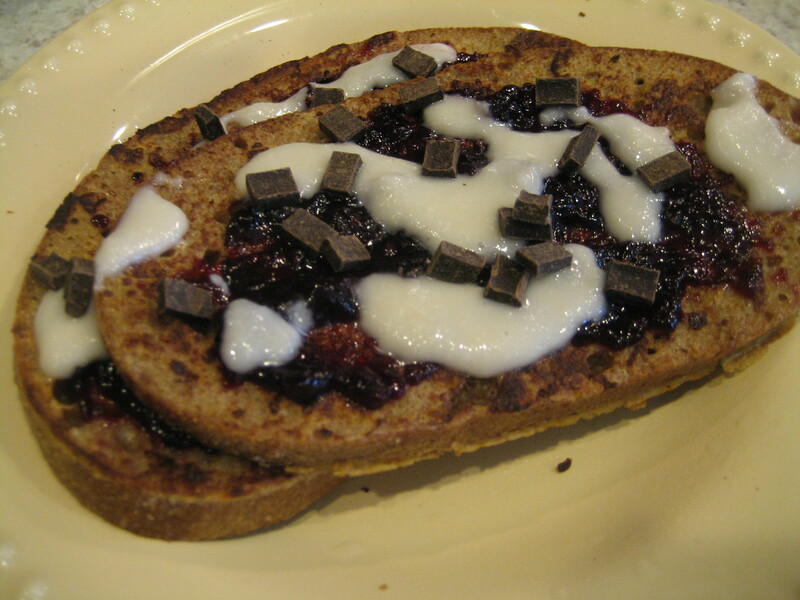 Great to change up my normal breakfast routine with something delicious over the weekend. After breakfast, we headed out to the Whole Foods mecca in Dedham. This is the best Whole Foods around, and apparently the largest in Massachusetts. We had extra time today, so it was a perfect time to check it out. I just love it there and could spend hours, but we were in and out within an hour today. We picked up our produce for the week, as well as some cleaning products. Every now and then, Whole Foods has great sales on products around the store. Today, mangoes were 2 for $1.50 (originally $1.99 each!) and Dr. Bonner’s Castille soap was 1/2 price! I got a $14.99 bottle for $8.99 – sweet! 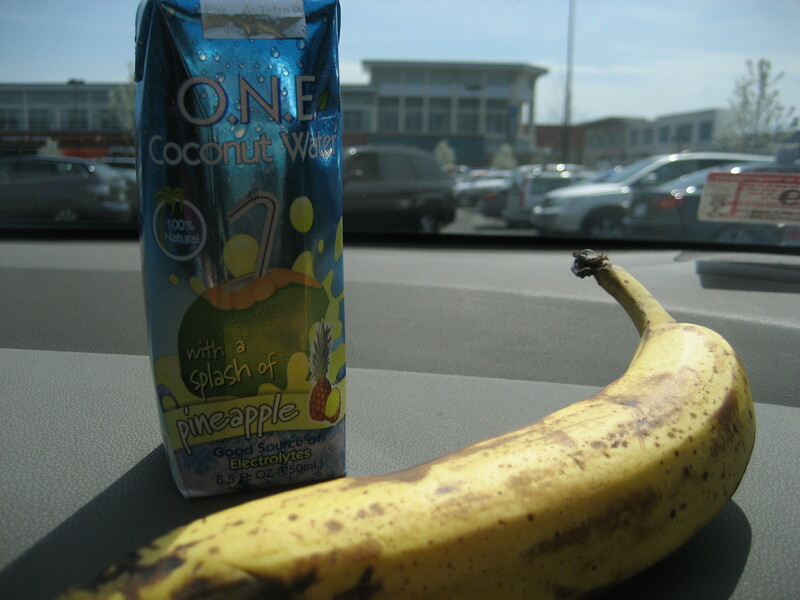 On our way home, I snacked on a banana and a Coconut Water with Pineapple. 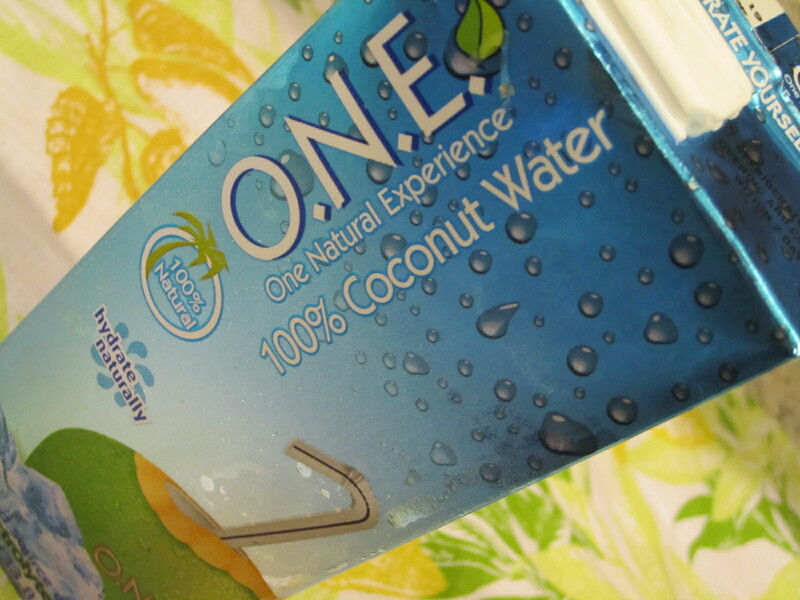 I liked this coconut water, but not nearly as much as the guava I tried the other day. But, I still prefer the original to both of them. Once home, it was time for lunch and then a nice long walk with Brant. 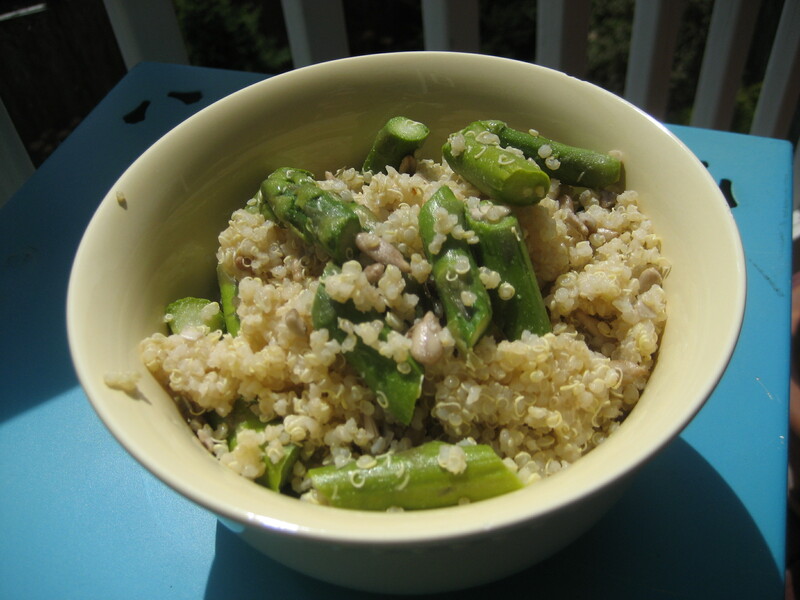 We both finished up the leftovers from Friday’s dinner – Tabasco & Asparagus Quinoa. We walked for over an hour all over Southie. People were everywhere! The weather was just too gorgeous to be inside. We spent more time outside cleaning up the porch and putting the chairs out. Now, I just hope it stays nice! I spent the early evening cooking dinner and making a few baked goods while my soup was simmering, which I will post about over the next few days. Right now, I’m ready to stay away from the computer for the night. But first, dinner. 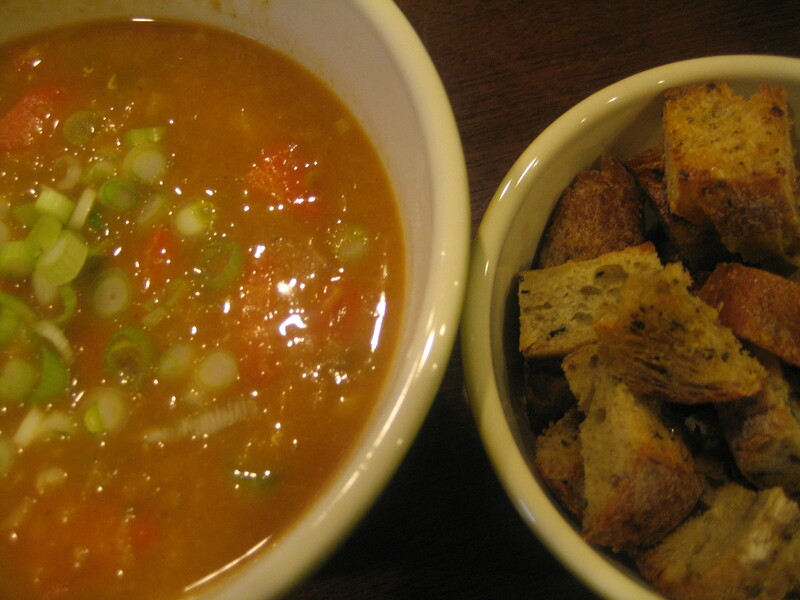 I followed Heidi’s recipe for Coconut Red Lentil Soup exactly…and it came out great! It is a great recipe to make when you don’t have many veggies in the fridge because you probably keep some of these items in your pantry (or at least, I do :)). 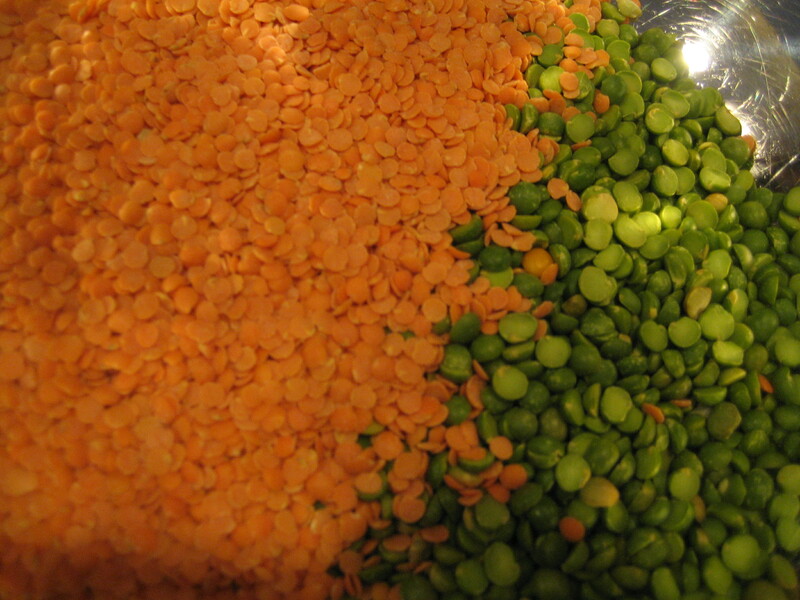 The combination of the lentils and split peas made a great soup thickener. 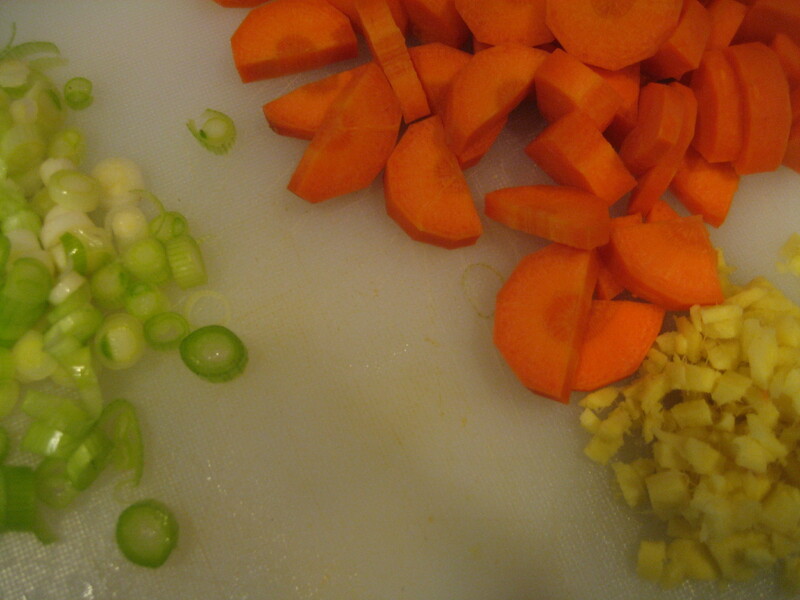 While they simmered away on the stove, I chopped up the other veggies. The carrots get thrown in right away. 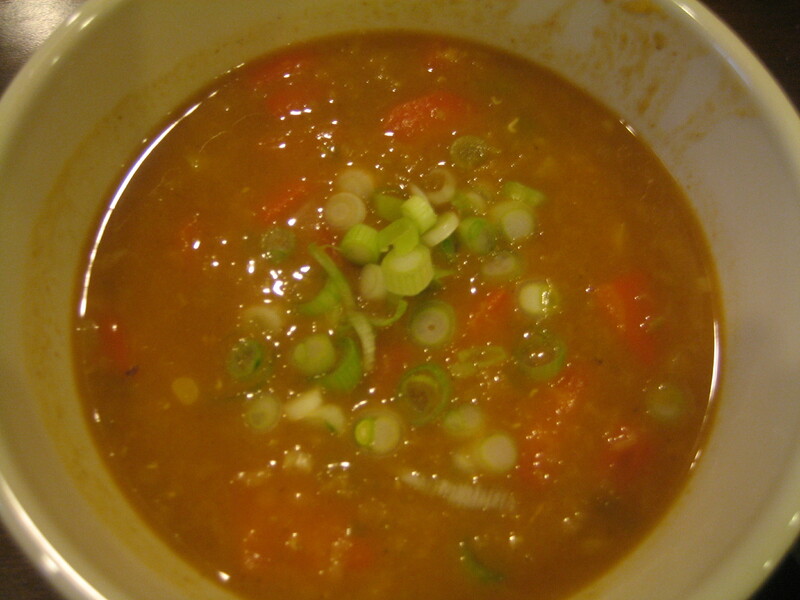 Then, the scallions and ginger get cooked with butter, raisins, tomato paste and curry powder in a separate pan. Then, are added to the soup. It smelled really good while cooking. 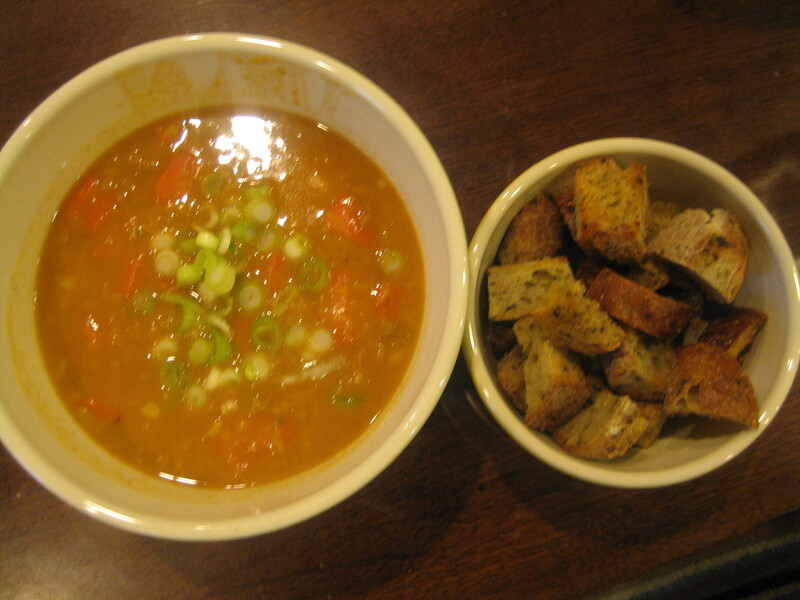 I simmered the soup for about 10 extra minutes to thicken it up, and I really loved the consistency. 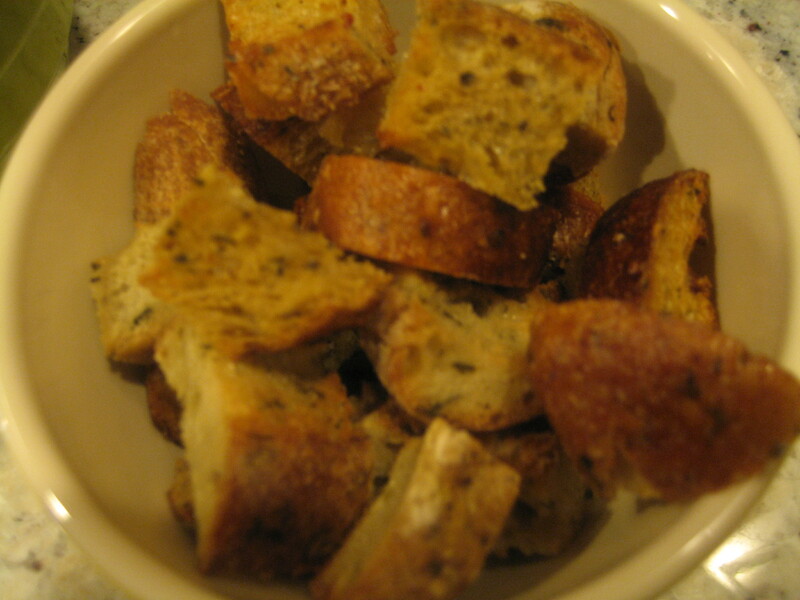 Instead of serving my soup over rice, I ate it with some croutons which I made from cutting up and toasting stale bread. I will definitely be making this again – and am so glad for the leftovers I will be eating all week. It was a tad bit bland, so I recommend salt and pepper. 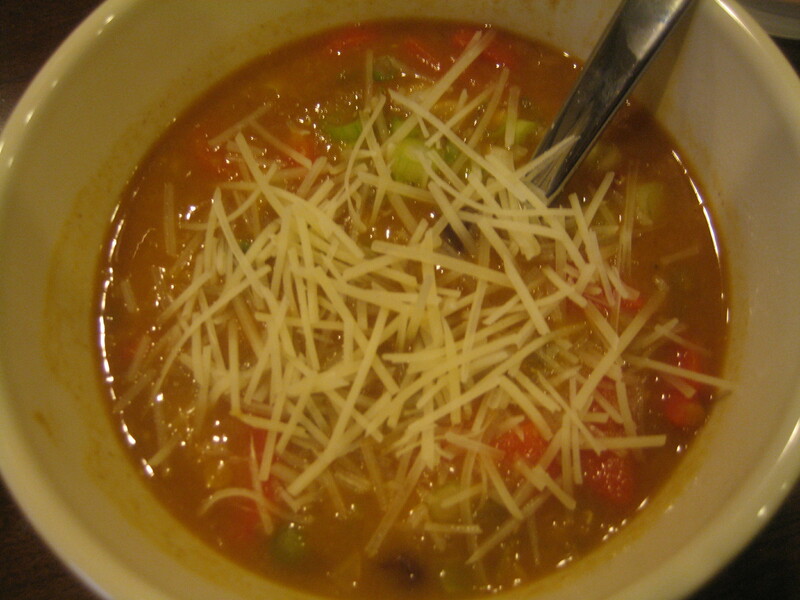 But, instead, I added some grated Parmesan cheese. Stay tuned for green cleaning products tomorrow – dish soap and all purpose cleaner! I made it to the gym!! It was just what I needed. 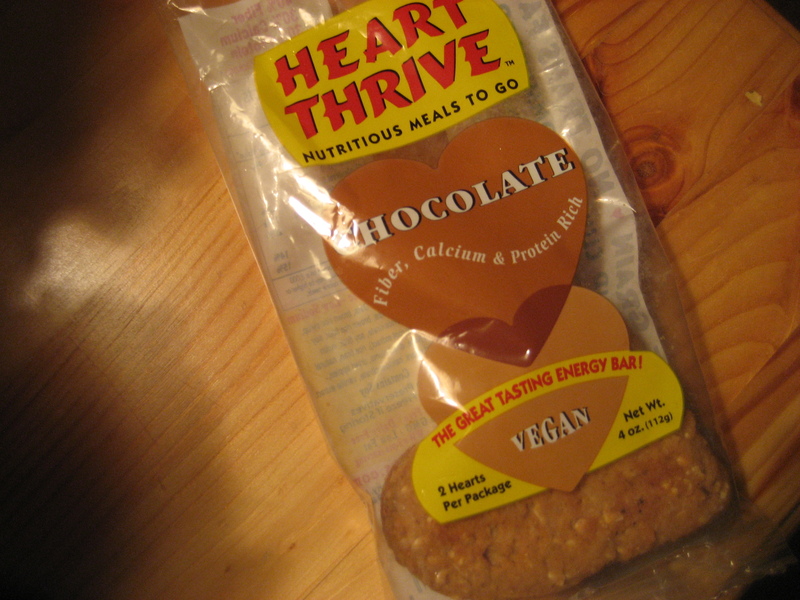 On my way to the gym, I snacked on a Chocolate Heart Thrive. I ran 4.6 miles in 40 minutes on the treadmill, then did some upper body weights. My legs felt pretty tight today, maybe from my faster run yesterday. They were tired after the run, so I decided against my circuit weight session, which would have included lots of lunges and squats. I save those for another day, and focused on my Shoulders, Chest & Triceps. 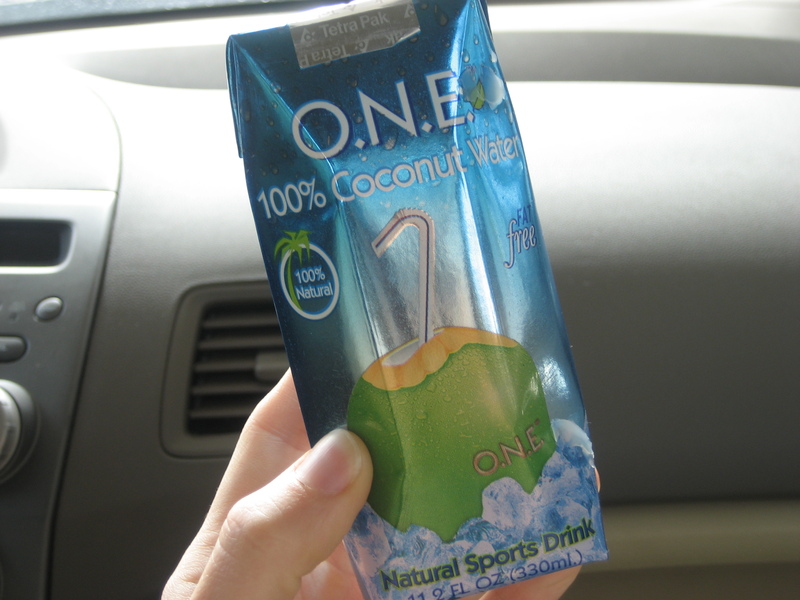 After my workout, I sipped on a new Coconut Water on my way home – with a splash of Guava! O.N.E. coconut water came out with a few new flavors of their coconut water, with just a splash of the juice. I also bought the mango and pineapple, so I can’t wait to try them! I loved the guava!! It was the perfect amount of ‘splash’. Not too sweet, but just enough to make it a treat. 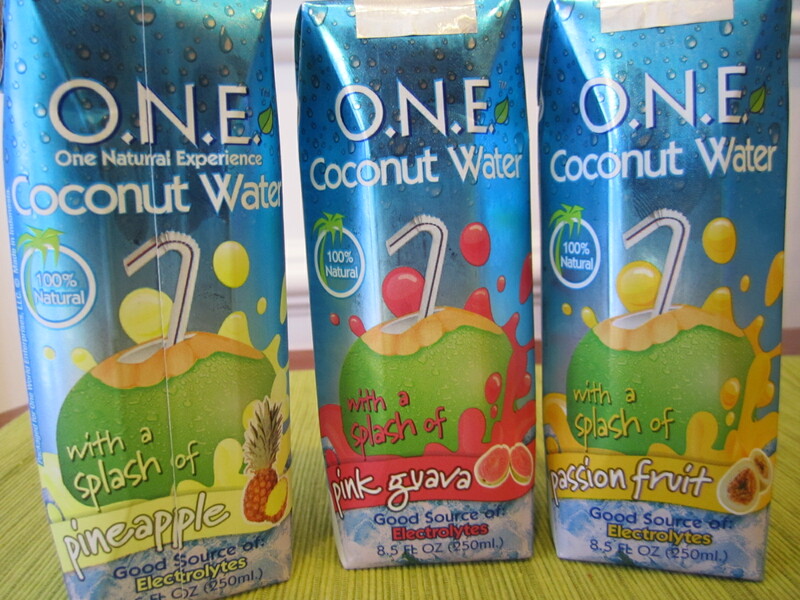 And, coconut water is a natural electrolyte, so drink up! Their other flavored coconut waters are a little too sweet for my taste, but I liked this, even though I’d prefer the original anyday. This one 8.5 fl oz serving has 78 calories, 16 grams of sugar and 18 grams of carbs. 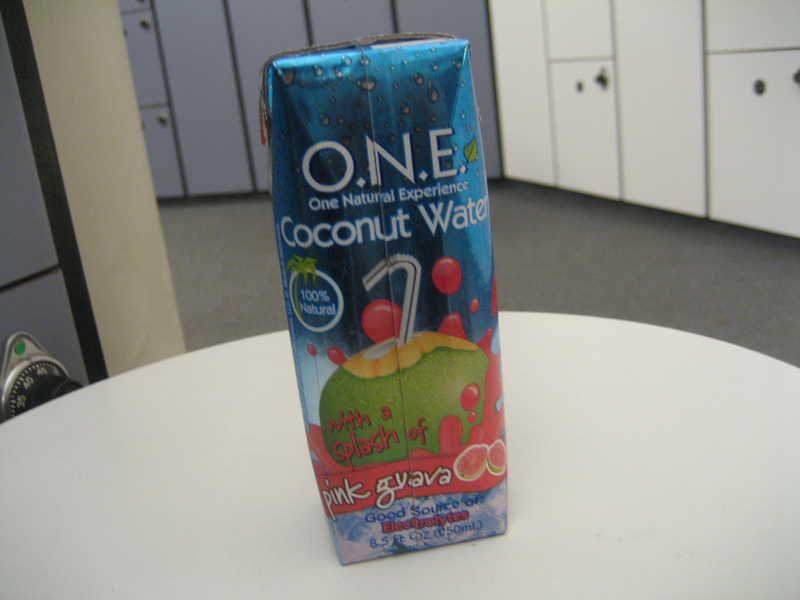 Not so bad, considering that regular coconut water has 14 grams of sugar. Once home, I made and scarfed down dinner in a matter of minutes – literally. I was starving! This was the worst wrap I have ever made! It tasted awesome, but the pictures are awful! This guy fell apart from the start. 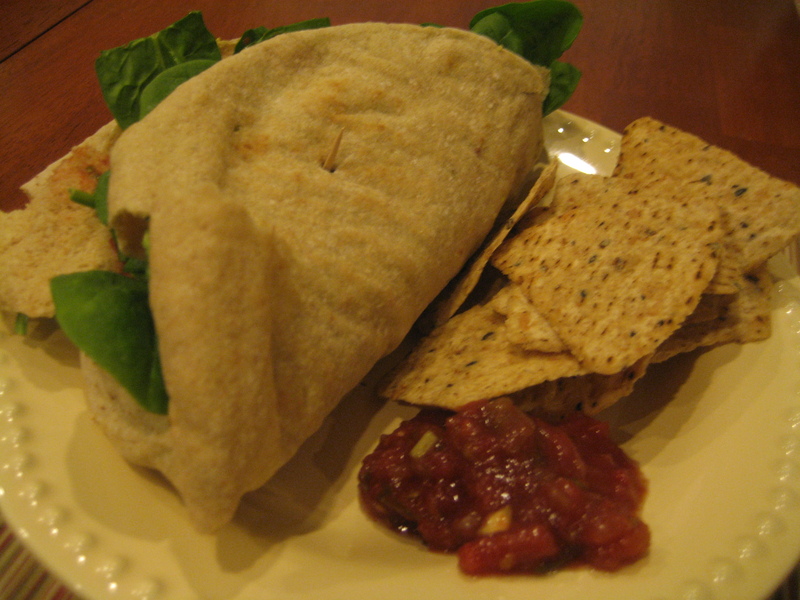 Anyways, I filled a Joseph’s flax pita pocket with spinach, a Dr. Praeger’s veggie burger, 1/2 an avocado and salsa. 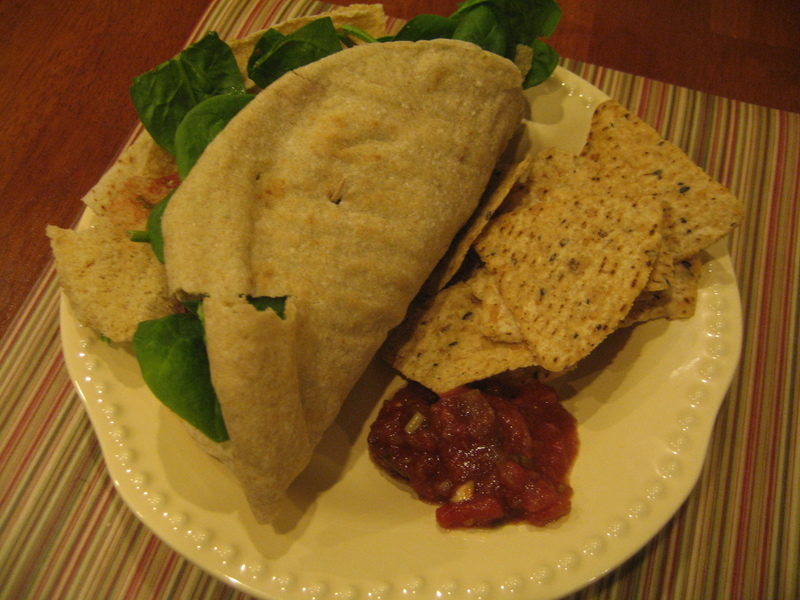 Delicious combo – with a side of multigrain tortilla chips & salsa. This has been a crazy week with what feels like every second filled – yay for Friday tomorrow! I got through my long run today in the mountains! Lots and lots of hills, but I felt great through all 11.5 miles. I kept an average pace of 9:20 per mile and took it nice and easy since it was a longer run. The experts say that you should complete your long runs 60-90 seconds per mile slower than your race pace. You don’t want to run them at an extremely hard effort because that will make you more tired and you won’t be able to complete the rest of your weekly runs at a good pace. The point of a long run is to build stamina and muscle memory. I think that my legs have no problem running for 1:45 minutes after all of that marathon training last summer and fall! 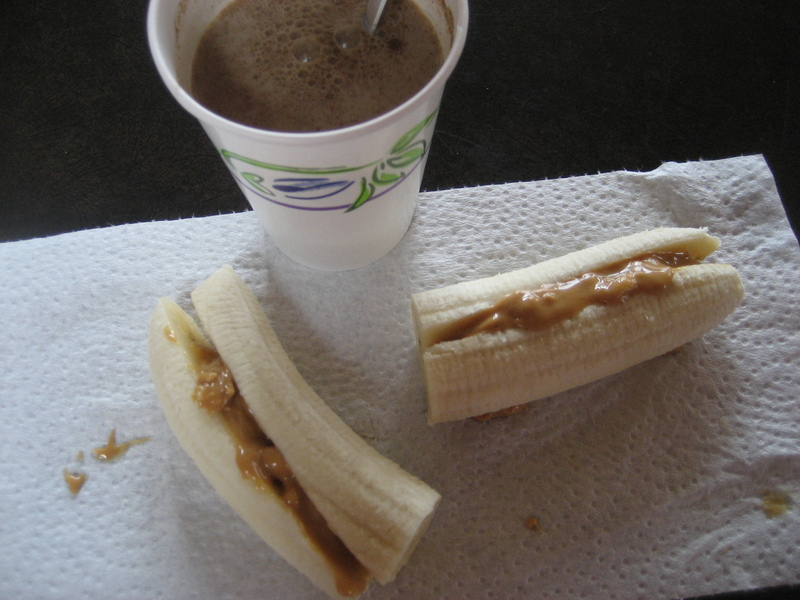 After my 11.5 mile run, I was starving, so I immediately dug into a snack to hold me over until lunch. Amazing grass mixed with milk and a banana with Barney Butter. I don’t think I have mentioned Barney Butter on here before. It is an almond butter that is mentioned on numerous food blogs out there! 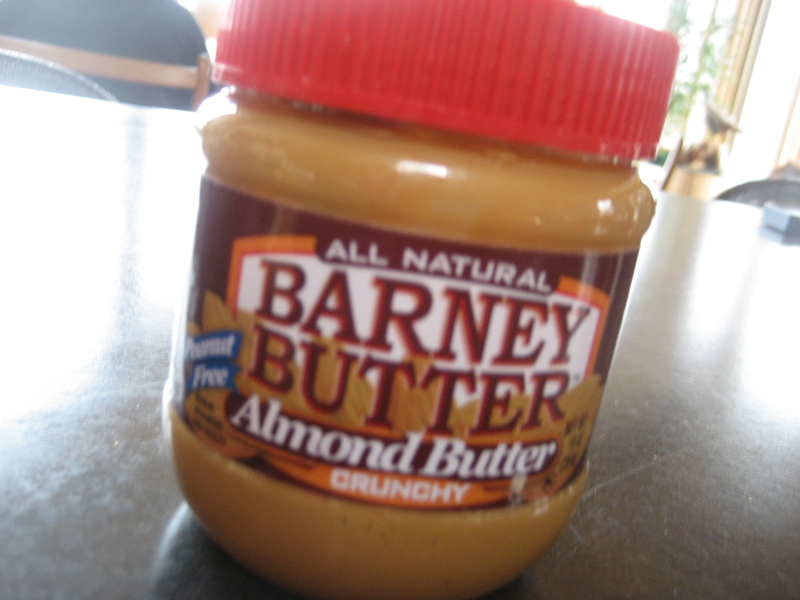 I do like it, because I love nut butters, however it is definitely not my favorite. They add cane juice and oil to the almonds to create the almond butter, which I do not like. It has a sweeter taste due to the cane juice. I much prefer Trader Joe’s Raw Almond Butter – it is to die for!! But, I bought the Barney Butter to try it out, so of course I will finish the jar! It tastes okay spread on a super ripe banana! 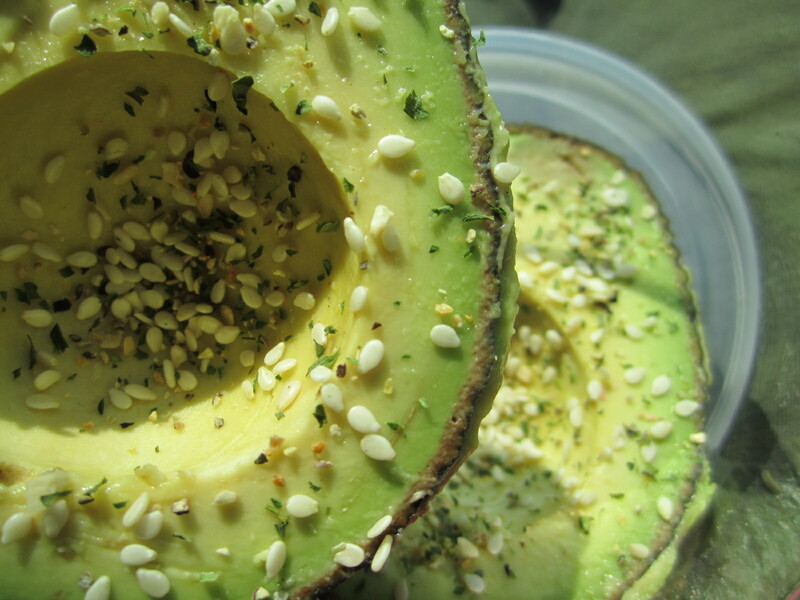 This snack did the trick. It contained lots of protein to fuel my tired muscles and held me over while I cleaned up. We had some leftover pizza for lunch before heading back to boston. 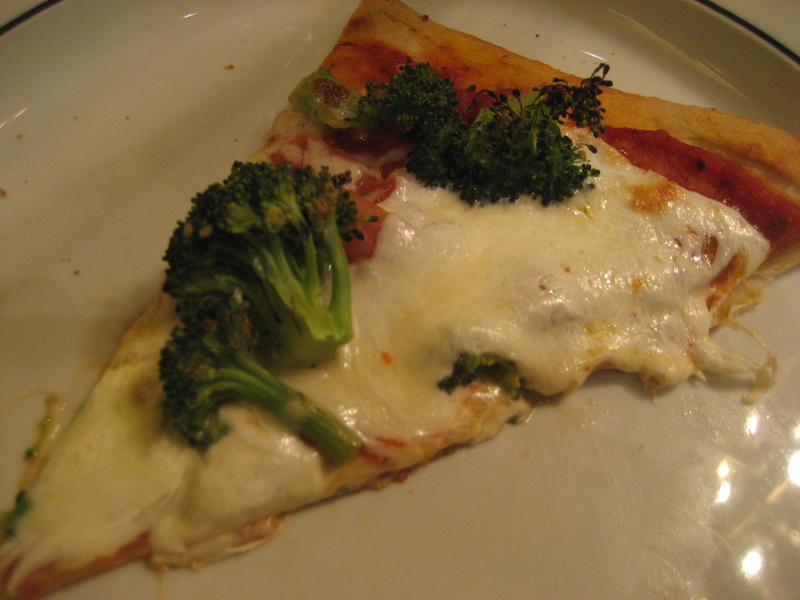 Once again, I had a slice of the Pear, Caramelized Onion and Gorgonzola and a slice of the Tomato, Mozzarella and Broccoli. 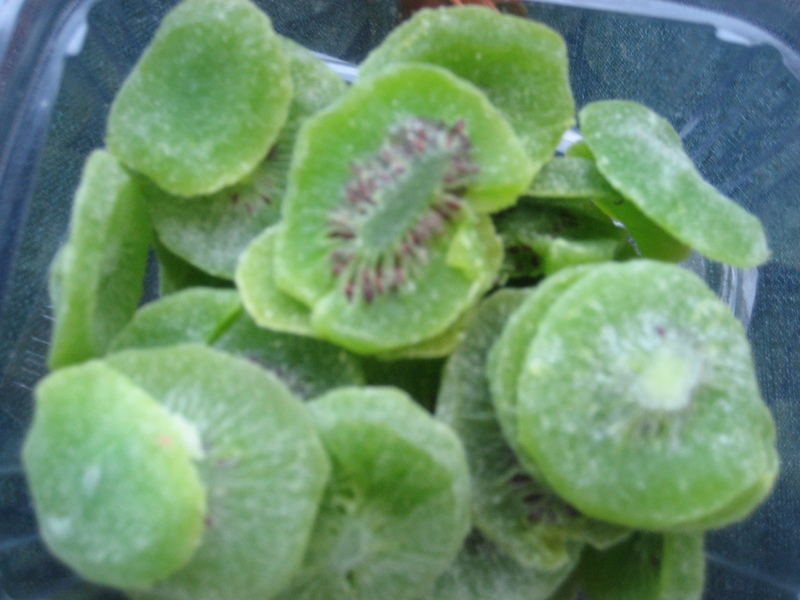 and snacked on a few dried kiwi’s, which are full of sugar. 😦 But, they were delicious and are more nutritious than eating candy! 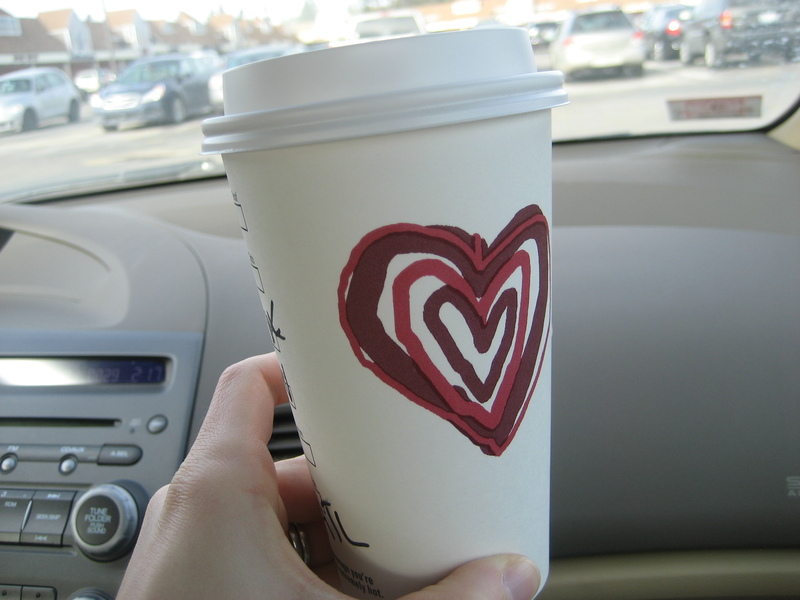 We also stopped at Starbucks, where I got an Awake Tea Latte – love these and love the cups! 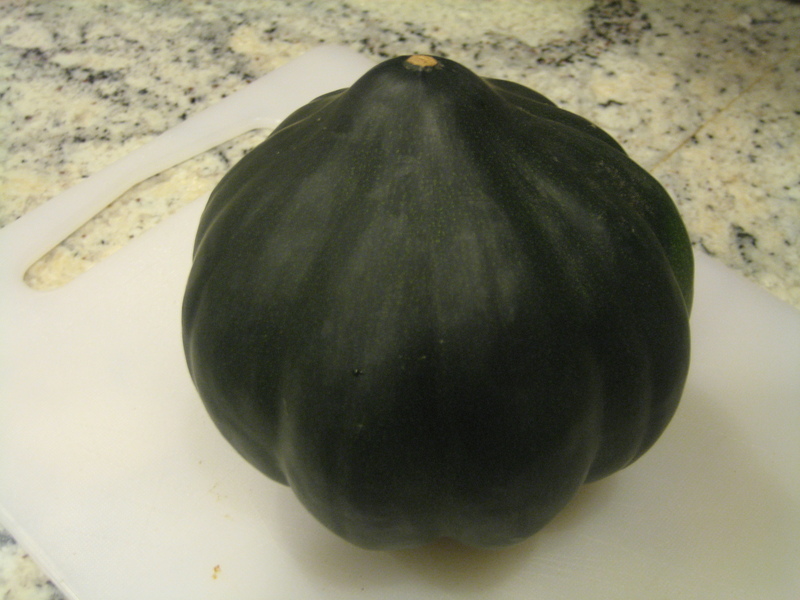 Once home, I unpacked and started on dinner – Stuffed Acorn Squash! I popped 1.5 cups of brown rice into my rice cooker to get started, then I cut an acorn squash in half and baked it for 30 minutes. This would have been a perfect Valentine’s Day meal, since they are shaped like hearts!!! While the rice and squash cooked, I started on the stuffing. I chopped up 2 cloves of garlic, 2 carrots and 2 celery stalks, then cooked them in a saute pan for about 5 minutes before adding 1 can of chickpeas and the cooked rice. I seasoned the mix with paprika, salt, pepper, brown sugar and red pepper flakes. 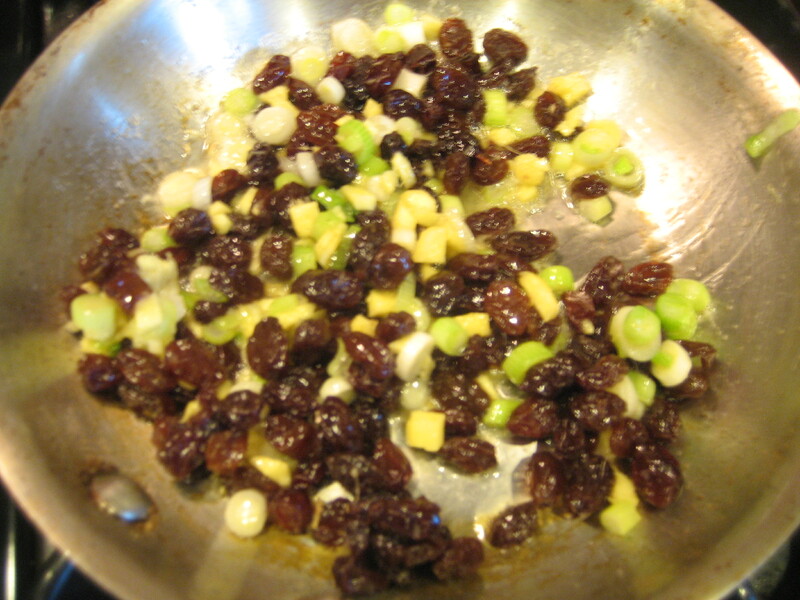 Then added a handful of raisins at the end and cooked until warm. 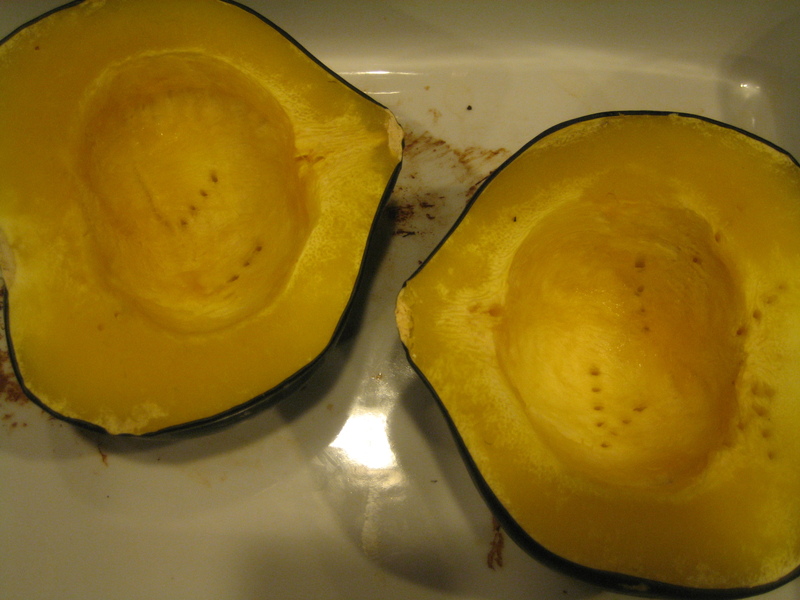 You will know that the acorn squash is done, when you can puncture it easily with a fork. 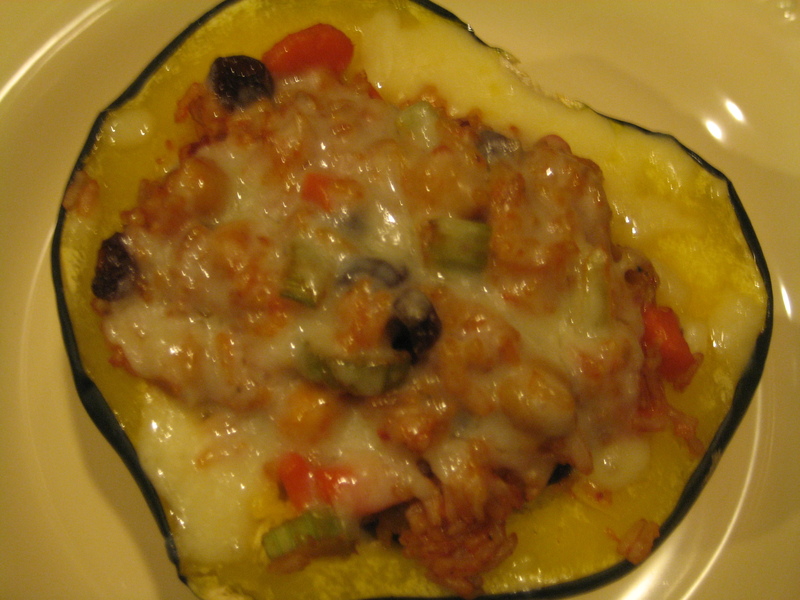 I then added the stuffing to the squash. And, topped the mix with shredded cheddar cheese and baked for another 7 minutes to melt the cheese! We really loved this meal. I would cook this again in a second! So delicious. 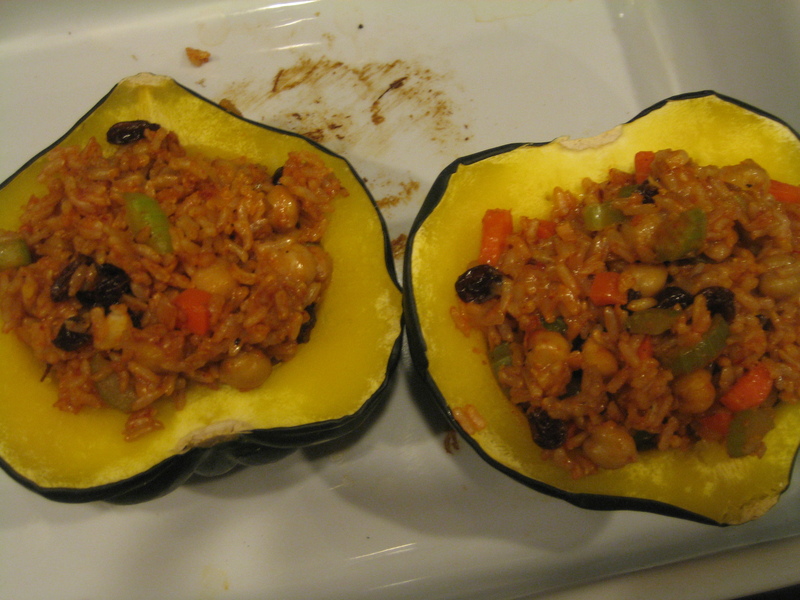 I loved the slight sweetness of the acorn squash paired with the sweet and spicy rice. 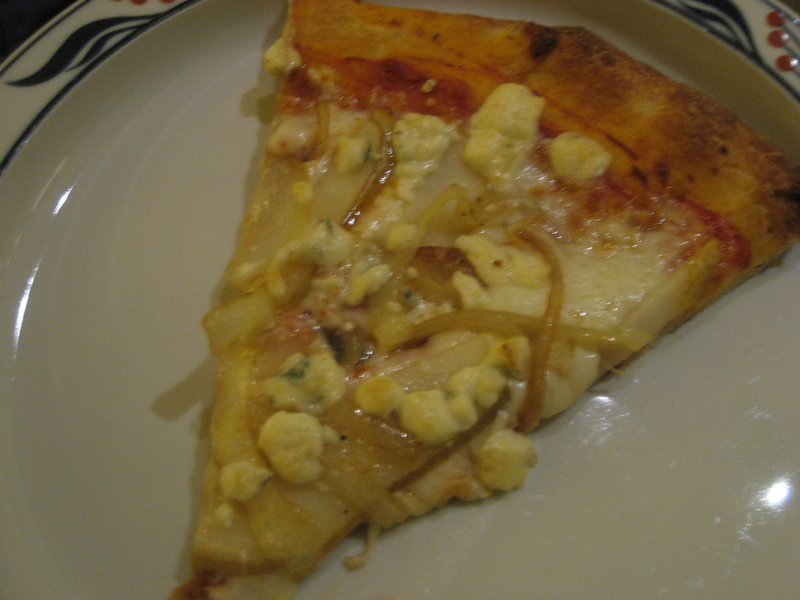 The cheddar cheese topped gave it a bit of tartness – yum! 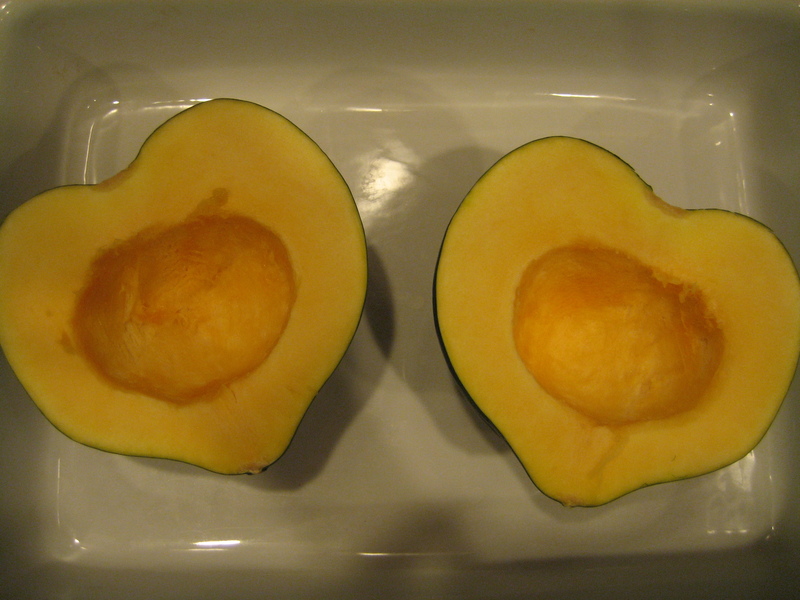 Cut 2 acorn squashes in half and bake at 350°F facedown for 30 minutes, or until tender. Meanwhile, chop the garlic, carrots and celery. Heat a skillet with 1 tbsp olive oil over medium heat. 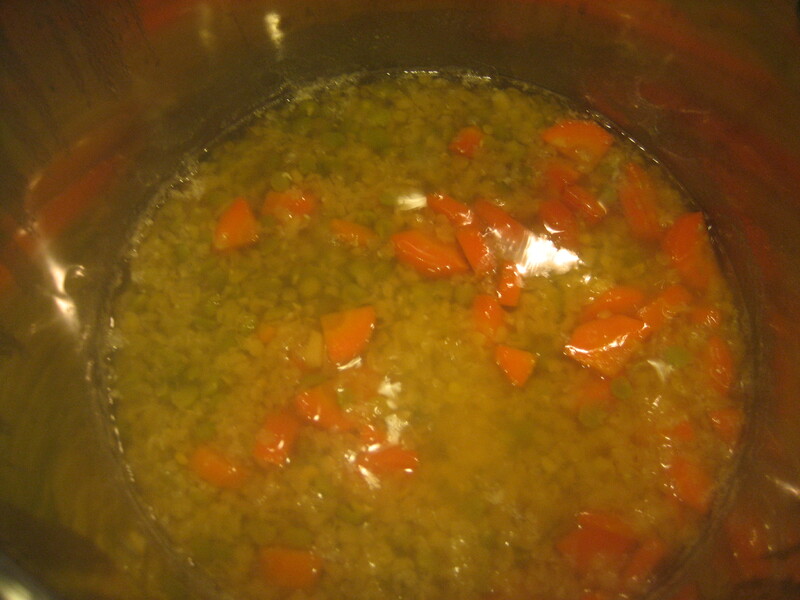 Cook the garlic, carrots and celery for about 5 minutes. 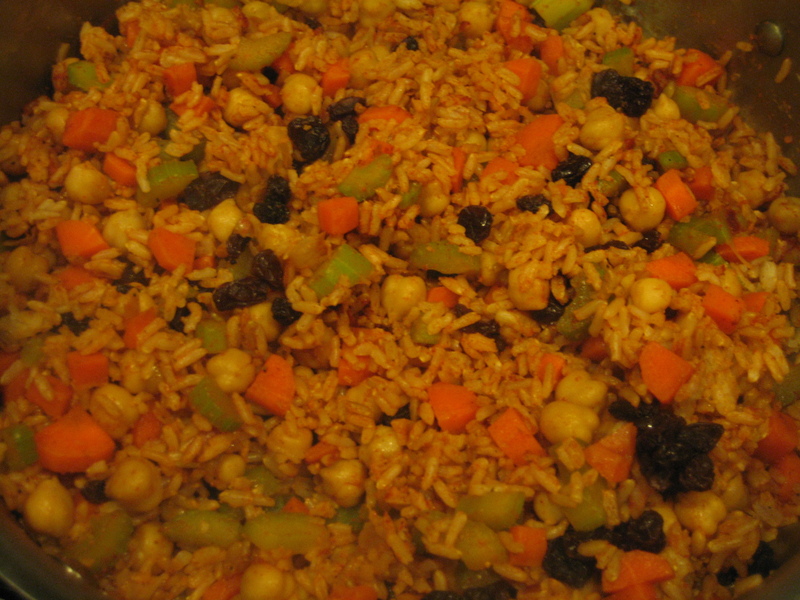 Add the chickpeas and cook until heated through, then add the rice. Mix in the rice and all seasonings. Add the raisins and cook for another few minutes, until warmed through. 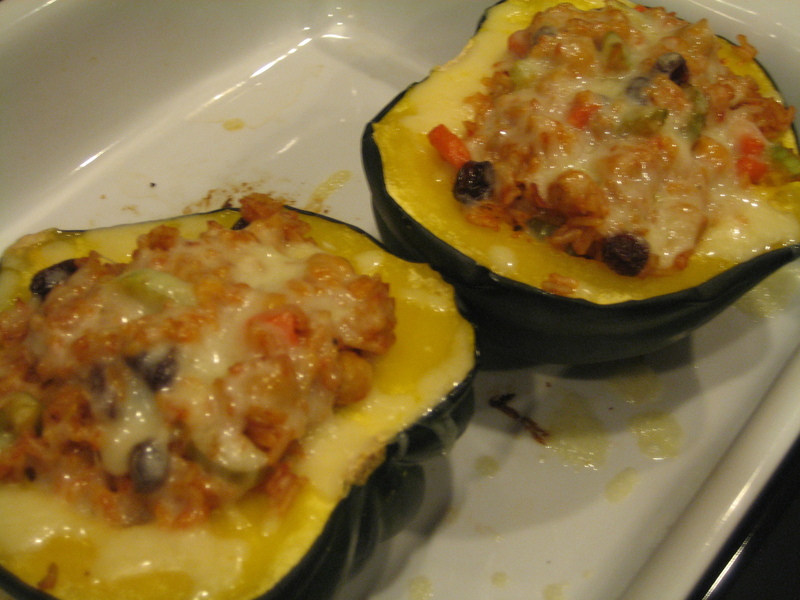 Take your squash from the oven and fill each center with the rice mixture. 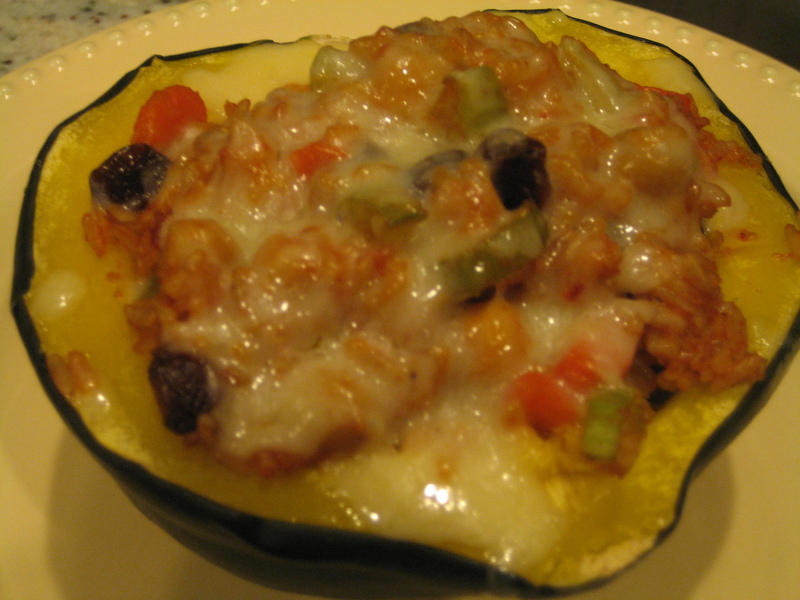 Top each squash with 1/8 cup cheddar cheese. Bake for another 5-10 minutes, or until cheese is melted and bubbly. Serve immediately after removing from oven. Time for the Olympics and Tea!